I recently took a class on basic self-rescue skills. I wrote up some notes to help me remember things and figured it would be useful to others! Check your and your partners harness, figure-eight and belay setups! An easy way to remember a munter is to create a loop towards the inside of the A formed by the brake strand and load strand and flip it over into the carabiner. The guide mentioned that in europe they are starting to belay leaders of the anchor. I’m not sure how exactly that works with quickly feeding rope in and out, since you can’t use your waist to maintain tautness on the carabiner. This is something to look into. When belaying a second, using a prusik or autoblock on the brake strand is a quick, valid way to back up the system when lowering. Check all friction hitches before trusting them. Dress all knots neatly! Setting up raising systems as a leader, from the top belay, is really easy. Compared to crevasse rescue, you already have an anchor ready, and no imminent danger of dropping the follower further into the crevasse. The munter is not a progress capture (ratchet). An auto-blocking munter is. A guide mode belay device is. We can leverage this to go through a progression of raising systems. Have the follower french-free by pulling on existing gear. Simply yank on the load strand. This may help the person get to a hold an inch away, or take some weight off them. If the follower is close enough, throw them a strand of rope from the free end. They should clip this to their belay loop (does not need a locker since the belay device is the primary attachment. This is a 2:1 system. They can assist by pulling on the strand from the belay device to them. To create a quick 3:1, attach a friction hitch to the load strand. Clip a non-locker to the other end and pass the free end of the rope through it. Remember to mind the prusik, extending it back out once it reaches the belay device. To create a 5:1, attach a double length sling by a carabiner to the anchor. This is the fixed end. Pass both strands of the runner through the carabiner attached to the prusik on the load strand from step 4 (instead of the rope). Clip another carabiner to the other end of the runner. Put the free end of the rope through here. Any of these systems can be complimented by adding another carabiner on the anchor to change the direction of force so it is easier to pull. Remember: The weight on the anchor is increasing for every addition. Make sure it is bomber! Friction can be reduced by using a pulley in place of one or more of the non-locking carabiners. Lowering is dangerous! You can lose control of the guide mode device once it is unlocked (has happened to me once, fortunately w/o bad consequences). Always back up the brake strand with a prusik attached to your belay loop, and tie a BHK (Big Honking Knot) for good measure below the prusik far enough to finish the lower. Unlocking the belay device has several steps, depending on the weight of the person and angles that make it difficult. Rotate the carabiner that is holding the rope through the belay device. This will let out a centimeter or so at a time. Put a carabiner through the small release-hole on the ATC and lever, using the carabiner as a handle. Put a sling through the small release hole (if possible). Girth hitch it, then redirect sling through anchor. Pull (You may need to use body-weight by attaching the sling to your belay loop and weighing it, or by putting your foot through the sling and pressing down. Load Strand Direct method: The intention is to use a carabiner to separate the load and brake strand where they enter the device, to remove the friction that creates the locking behavior. Clip a carabiner between the strands, trapping the load strand. Clip a sling to this carabiner and reroute through the anchor. Pull as in step 3. Devices like the DMM Pivot are easier to release for lowering. Initially the person is attached to one primary anchor, which we have to unclip for some reason (pass a knot or because it is on the belayer’s body and we want it on the anchor). Use a friction hitch from the anchor to the load strand as a secondary system. Use the free end of the rope to attach to the final anchor. At this time, the victim/person is attached to various places by 3 systems (the primary rope, the secondary rope, the prusik). Use a series of munter lowers and slack management to unload the primary rope and load the prusik. Since the prusik by itself is not load rated, we need the secondary attachment as a backup. Undo the primary. Take the slack out of the system. Use munters to weigh the secondary attachment (which has now become the primary). Undo the prusik. It is important in all cases to manage rope lengths so that the prusik does not go out of reach while it is being moved around! To put this into context, here is a good video by Northwest Mountain School. For passing knots (due to core shot isolation, or because two ropes are tied together), it is important to decide when to start the transfer to avoid 5 above. Also, do some creative slack management as required. We are not trying to pass an IFMGA exam here, so as long as the anchor is solid and the person on the load strand is OK with it, it is acceptable to induce some shock load on the anchor. Mule overhands: The complete combination of using a prusik attached to an anchor by a munter, and then tied off (hands-free) using a releasable mule hitch and an overhand for backup, is referred to as a PMMO (Prusik-Munter-Mule-Overhand) in literature. The Munter Mule Overhand can also be used on the rope itself to go hands-free. A Mule Overhand can also be tied on a belay device. A mule is releasable under load unlike using an overhand or figure-eight to close a system. A mule is formed by forming a loop from the free end of the rope that captures the brake strand and the load strand on the same side and pulling a bight from the free end to finish the “trap”. Make this as close to the munter or belay device as possible. The bight is tied into an overhand that should capture the load strand. Leave enough tail out to ensure the overhand can’t untie. If there isn’t enough to tie an overhand, clip a carabiner through the bight of the mule and clip it back to the anchor or similar. Remember, the mule is releasable and we don’t want it to release just yet! A rope MMO tie-off just by itself is considered completely secure and does not need any backups. For passing the knot, we are going to use the scenario of us lowering a climber from an anchor. The system stays the same in other scenarios. Think through it in terms of steps 1-4! We are using a prusik on the brake strand to control the lower. Eventually the knot we want to pass approaches the prusik. Before this gets too close, stop the lower, release the prusik (careful!) and tie off the rope using a MMO. Now you can go hands free. Use a long cordelette to tie a prusik/kleimheist to the load strand. Attach another locker to the master point. MMO the prusik to this carabiner with no slack (pull the prusik close to the primary anchor). Add another locker to the anchor. This locker is going to replace the primary carabiner so we can pass the knot. Grab the free end of the rope past the knot. MMO this to the carabiner you just added. You have now “passed” the knot. We will use the system we set up to transfer the load — take out the little slack between the two rope attachment points — without shock loading the anchor. Remove the very first rope attachment MMO completely. Take the carabiner from the anchor if it is easy to retrieve. Otherwise you can grab it after the transfer is complete (Remember at this point you may have 4 carabiners through the master point!) It is also OK to connect the prusik carabiner to the carabiner holding you to the anchor via a clove hitch. Now, the prusik is holding the load, with the rope MMO as a backup. Undo the MO on the prusik and slowly lower the munter until the rope takes the weight. Remove the prusik setup. You are done! Release the rope MO and continue lowering. Logically, the first rope MMO is solid by itself, so step 2 can actually be done after step 4. When using a belay device instead of a munter, the process is only slightly different. In step 4, instead of MMO, tie a figure eight on a bight past the knot (leave 0.5-1 feet of slack between the figure eight and the knot to pass), and clip the bight to the second locker. While the prusik holds the climber, this acts as a backup knot. In step 5, after removing the first rope from the system, you will have the empty ATC at the anchor. Put the part of the rope between the backup and the knot to pass (the 0.5-1ft of slack we left) into the ATC. The ATC is now usable again. Again use the PMMO to transfer the climber onto the ATC. Then undo the backup and continue lowering. This knot passing remains the same on top rope lowers, except all of these locking carabiners will be on your belay loop instead of on the anchor. When passing a knot on rappel, you will do the same, with the backup figure eight on a bight below the knot to pass, clipped to your harness so you only fall 2-3 feet if your prusik fails. Use the prusik, clipped to your belay loop, to hold you while you undo and redo the ATC. When raising, a knot can be passed by putting another ratchet on the climber’s side of the knot once they are close enough (a PMMO backed by a figure eight on a bight on the rope). Remember that unlike an ATC in autoblock mode, a prusik ratchet has to be slid down the rope and made taut for it to act like a ratchet. Necessary when you were belaying off the body and now need to transfer the climber onto the anchor so you can go assist them or run for help. Lock of the belay device on your harness with a MO, so you can go hands-free. Use a long cordelette to tie a PMMO from the load strand to the anchor. Set up another MMO using the rope on the anchor. This is both a backup while you are escaping, and will eventually become the primary anchor. Load the PMMO by undoing the belay device MO and lowering until the prusik is taut and holding. Remove the rope from the belay device. Take in slack into the MMO if necessary. (This is important to avoid the prusik going out of reach). Release the PMMO and lower the climber onto the rope MMO. Remove the prusik. Boom! You are out of the system. Extending the belay loop is always a good idea for multiple rappels. Only the first descender needs a third hand. Everybody else can receive a fireman belay. Gloves are nice to have! If you need to ascend the ropes, remember that an autoblocking belay device is a ready-made progress capture for ascension. Use a locking carabiner from your belay loop to the guide mode loop on the belay device (This requires the device to be extended!). This will orient the device into friction mode when weighed. Haul up, let it lock. Haul up, let it lock! Use saddlebags on low angle, loose rock, or high wind situations. First time in the Bugaboos: I will be back! Every once in a while, a trip goes so well, you want to thank the entire Universe for not conspiring against you. Such was the Bugaboos. The weather was ideal, the company was nice and the views were spectacular! The rock? Bugaboos rock is perfect! Much has been written about the Bugaboos, so I won’t go into the logistics and route details, focusing instead on the trip. We hiked in July 22nd and hiked out July 29th. I flew to Spokane Friday night where Mason picked me up so we could crash at his parents house in Couer d’Alene. On Saturday morning we drove 7 hours to the Bugaboos parking lot, with a requisite “when-in-Canada” Tim Horton’s stop in Cranbrook. This was a longer drive than Calgary, but saved us a lot of money on a car rental. We bought all our food in the US since there is more choice here. After the requisite chicken wire around the car, it was time to hike in. It should be pointed out that nobody has really tested what happens to a car without chicken wire in years. Perhaps it is just a cargo cult. But then, you wouldn’t want to be stuck without a functioning car in the middle of logging roads, some 30 kilometers from civilization. The drive in was typical Canadian beauty, lakes and rolling valleys with some nice western view of the Canadian Rockies. To get to Paradise, you’ve to pass through suffering, and prove yourself worthy. Appropriately, the hike in to the Bugaboos is hard. If you are making a trip from far away, you’ll be spending at least a week, so there’s 7 days of food, plus all the climbing gear, and a smattering of luxury items like a larger tent, flip flops, and various changes of clothes. I estimate my pack was 45-50lb. To get to Applebee camp you gain some 3000ft in ~4mi, traversing dynamite cut ledges up a glacial valley. By the time I got to the Kain hut, about an hour before Applebee, I was having to stop, if not sit, every 10 minutes. The only thing keeping spirits from dying were the spectacular views. The Kain hut itself is set on some of the most valuable real estate on the planet. At least if you are a climber :) For some reason, it felt harder than the Palisades hike in, even though we had less gear and less distance. The humidity lower down didn’t help. By the time we collapsed into Applebee, the only shirt and pants I intended to wear for all the climbs, was completely soaked through. As if to front load general misery, it rained that night and I ended up cooking in the tent. That was it; we had passed the entry test and we were rewarded with a week of nearly windless and rainless days. The next day, hips sore and skies cloudy, Mason, Yelly and I scrambled up Eastpost Spire via the easy class 4 route from Applebee. It took about 40 minutes to reach the top and we got to see great views of the Bugs. Ryan and Leo went to McTech Arete for their idea of an easy day. Back at camp, there is a left leaning, slightly wider than hands, crack about 50ft below and north of the main tent spots. Mason and I toproped these after a failed attempt on lead due to a shortage of #2 and #3 pieces. On Monday, all of us headed up to the West Ridge of Pigeon Spire (5.4). For 3⁄5 of us, this was the first experience up the col. While it looks pretty imposing from camp, the col isn’t that high, may be 600ft, and Applebee to top of the col takes about 90 minutes for most people. Pretty standard ice axe and crampon technique, and there is a decent boot pack. As you near the top, pay attention to the left rock buttress as the second from the top rap anchor is hidden in a sort of overhang. At the top of the col, is your first unique restroom experience; should you choose to use it! The upper Vowell glacier is a remarkable expanse of ice, and is well behaved when compared to the Bugaboo and lower Vowell. It was crevasse free on the Pigeon-Howser straight line, until the very end, where a crevasse was starting to open up right below the base of the west ridge. It was about 3ft wide and easy to jump or circumvent. The 50ft to reach the col where the trickiest part of this whole trip; icy and loose rock. With three parties ahead of us, we took our time at the base. The second green restroom in the park is here, as is a giant marmot. 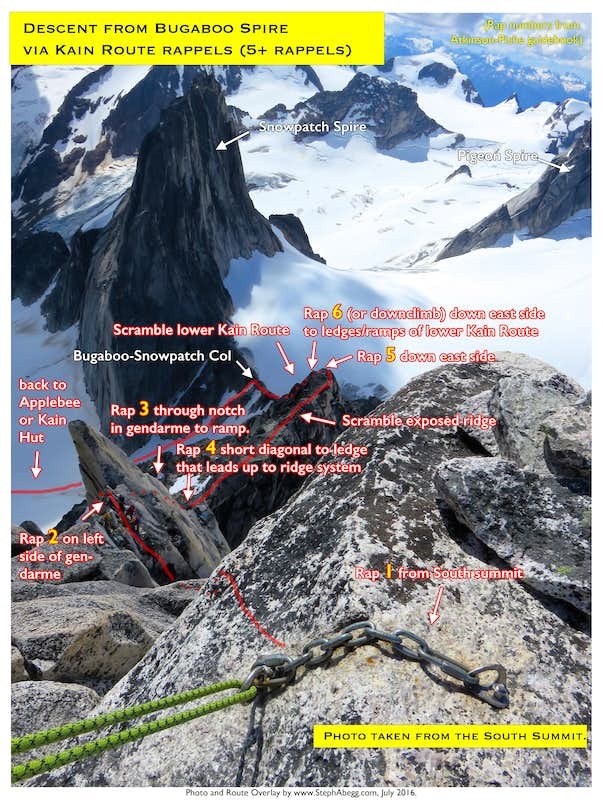 The West Ridge of Pigeon Spire has been called the best 5.4 on the planet. It is not hyperbole. The solid rock and easy route-finding let you enjoy the ridiculous views. 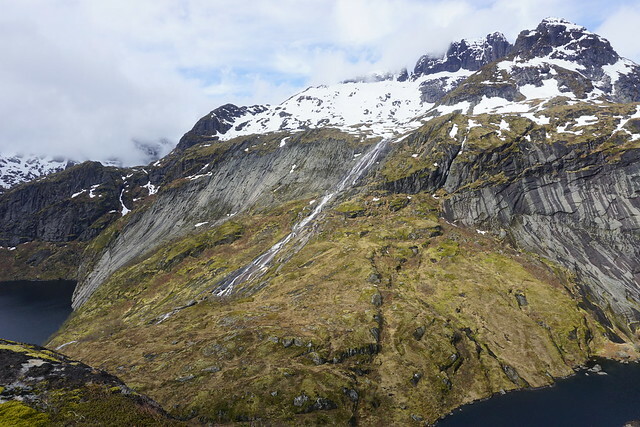 Pigeon’s location lets you see the two major glaciers in the park in all their glory; the Howsers rise in splendor out of the Vowell, while the Hound’s tooth towers over the Bugaboo icefall. Mason and I were one team, while Ryan, Leo and Yelly would climb as three. We soloed until the first false summit, with only the mantle move left of the chimney squeeze being spicy. The descent down the ramp south of the first summit is a really beautiful space; my favorite feature of the climb. From here we simul-climbed. The terrain keeps changing between easy 5th and wide 3rd class ledges, with great protection throughout. On the final section, the route is north of the ridge and it got extremely cold. When Mason finally put me on belay from the summit, I was glad to start moving on numb feet. The descent raps require some contortion and drop you to the base of the last “pitch”. From here, reverse the route to camp. On day 3, Mason and I did the Kain Route on Bugaboo Spire. We ran into a couple from California at the beginning of the route, and we took turns route-finding until we ended up at the 5.4 “chimney” section. Here, we roped up and I led the chimney, and belayed everybody up. There are 3 rap anchors on this lower section of the ridge. The lowest of them avoids a tricky, but really short downclimb, and I’d suggest not using it unless your party is really uncomfortable. The rope tends to get stuck! The top of the “chimney” gets you to the top of the ridge. The scramble to the base of the 5.6 pitch is nice and spicy, with great hero shot potential. The couple soloed this, while we simuled, so we were surprised to see them just sitting at the notch when we arrived. They hadn’t brought rock shoes and didn’t seem too keen to climb the difficult pitch. This seemed like one of those “stupid light” decisions. Adding another pound of weight would’ve meant they didn’t have to do all of this climbing only to turn back 2 pitches from the summit. Oh well! Mason and I only had a single rack for this ascent, this was about to send my adrenaline response through the roof. Cue “stupid light” above. Haha! The Kain Route’s crux isn’t hard, but it is exposed. I laced up a lot of the crack, and ran out of gear by the time I reached the final slab traverse. Oh oh! A stuck tricam offered one clip, but I was still dealing with a 6ft swing into rock should I mess up. Going from the slab to the chimney requires one committing move, that would go much easier with a piece right above the move. Fortunately I stuck it, scampered up the boulders, used my personal anchor and the carabiner that had the nuts to clip the one old bolt and then the web-o-lette to anchor myself at the belay. Phew! Mason followed and then led the flaky corner to the summit. The views from Bugaboo Spire are gorgeous. Several NE ridge climbers turned up at the same time and we spent some time chatting and relaxing. It was now time to start the descent. Steph Abegg’s annotated guide is really helpful for this. A couple of rappels are in non-obvious locations while others require diagonal traverses. It is also nice to not be the last party on the descent. There is plenty of potential for stuck ropes. Needless to say, our rope got stuck on rap 3 and we spent 30minutes waiting for the party behind us to come free it (We could have climbed up and freed it, but we were in no hurry and the weather was stable, so we just waited). The rest of the descent was uneventful, in fact we soloed the ridge on the descent. The Kain Route descent is best done by sticking to the ridge as much as possible. It is a long way back to camp. On the day we did the Kain, Leo and Ryan had done Sunshine Crack, a 5.11 crack that goes from bottom to top on Snowpatch. Given that all of us were exhausted, we opted to do Lion’s Way, which is a really short walk from camp. Ryan was going to use the rest day to get more food from the car. We left camp around 10, waited for an hour at the base for another party, climbed occasionally, and eventually reached one of the summits of Crescent Towers. There are a few cool moves on the climb that are worth it. The descent is ugly choss that drops you at the north end of the Crescent glacier. Here we wandered uphill a couple hundred feet to scope out the ascent for the NE ridge of Bugaboo spire before heading back to camp. Neither Mason nor I felt great about leading pitch 1 of the NE ridge, which is rated 5.8, but has awesome exposure and is just the beginning of a long day. That is, I was confident in my ability to lead the pitch independently, but doubted I had the mental strength to climb another 7 pitches after that. Leo, nice guy that he is, was willing to lead it for us and belay us up. Yes! Leo, Yelly, Mason and I left camp at 4. Even at this ungodly hour, there was a party ahead of us on the route. Getting to the base of the route requires some sketchy slab climbing, especially if the snow patch at the base is still large. We were waiting at the base by 6, and watched more and more parties scurry up. We would find out later that some 8 parties showed up after us, and eventually several of them just had to turn back. I was happy we woke up early! Leo made short work of the pitch. I definitely felt the hollow flakes at the top were harder than the 5.8 lieback that is considered the crux. We switched into 2 rope teams and I took the lead for the remaining two pitches that put us on the ridge. From here Mason showed that he is great at hand jams and made his way up 3 more pitches, where we got into the wide chimney. We took turns simuling and belaying based on rope drag until I stepped out onto the final part of the ridge. I wish I had a 70m rope, as we had to do an extra pitch for less than 15m to gain the North summit. The exposure and rock quality on the NE ridge are spectacular, no wonder it is one of the 50 Crowded Climbs of North America. The views are unbeatable too! The traverse to the South (true) summit starts awkwardly, gets obvious and really spicy on a pant-tearing-ly knife edge ridge, before mellowing out at a rappel station below the summit. Since Mason and I had already signed the register, we didn’t go up to the summit, but retraced the descent from 2 days ago. Yelly and Leo were happy to have someone who knew the route guide them. Clouds and rain came in just as we got to B-S col. Fortunately they did not last long. The first time, we did 2 single rope rappels, then downclimbed steep terrain. This was the slowest. We didn’t know the third rappel station was on the western side of a rock outcrop. The second time, we spotted the third rappel station on the way up. We did 2 single rope rappels to the third station, then another party let us use their double rope rappel. This was perfect because it dropped us straight to the gentler part of the col and sped things up. The third time, with 4 people and 2 ropes, we put everything together. We did a double rope rap straight to the third anchor. This saved time and avoided the really awkward second rappel stance. Then we did another double rap straight to the gentler part, and glissaded all the way to the bottom of the col. The col had deteriorated significantly in our week there, going from no visible bergschrund to a sizable hole. Friday was a complete rest day, we literally did nothing but sit around camp and talk and eat. On Saturday, Mason and I took our time hiking out, while Leo and Ryan went for their attempt of the Beckey-Chouinard on South Howser Tower. The hike out is almost as brutal as the hike in as the temperature rises, the insects are back and your knees are hosed. Finally the car! After a quick stop in Radium for lunch, we made it back to the States. Mason’s parents were gracious enough to host me for another day and a half and I spent some time experiencing non-California America. Lake Couer d’Alene is beautiful and I had three fantastic meals - a great Chicken and Waffle at Crafted, “nutritionally dense” crepes at Le Peep and home-made burgers. I flew home on Monday with an excellent view of Mt. Shasta on the way. Many of the moderate routes in the Bugaboos don’t require extraordinary fitness. The elevation gain is 2-3k feet and only a short walk from camp. What is required is the ability to deal with exposure and climbing rock for hours. You will also want to be fast on rappels. Learning to use, and carrying, half ropes would be a very valuable skill. It would save each climber some weight, none of the classic routes are hard, so they can be led with just one half, and getting down the col would be really fast. For base camp trips like this, a larger tent is worth the weight. I carried an ultralight 2p for just me, and it was great to have the extra room to spread out gear, not worry about weather and sleep comfortably. Don’t stay at the Kain Hut if you want to climb. It is another 45min and 1000ft of gain for most climbs. Do stay at the hut if you are there just to enjoy the views. This might be the best equipped hut in North America. Take the smallest ice axe and lightest crampons you can. I had the Petzl Leopard FL and they were perfect, but I only have a 65cm axe, and that was annoying while climbing. You can leave gear at B-S col for some climbs, for others, it just has to come with you. If it’s possible, carry up light mountain boots, approach shoes AND flip flops to Applebee. Whenever I was moving up or down the col, or on the route to Pigeon, I was glad to have mountain boots, the approach shoes will help on non-glacier routes around camp and keep you comfy on the West Ridge of Pigeon. Your feet will thank you for having flip flops around camp. I have to get a better alpine rock harness. My gym harness is bulky and doesn’t fit well into packs. I opted to take the BD couloir instead. This worked great for the easier routes, but on the NE ridge, with a full rack, I was fighting it a lot. Mason and I each carried a “single rack” - for me this was 2-3 micro cams, C4s from 0.5-#3, DMM wallnuts 1-7 and 6-7 slings. This was more than enough gear for the routes we did. We also each carried a 60m single rope. My rope ended up staying in the tent the whole time, and was 8lbs of training on the hike in. 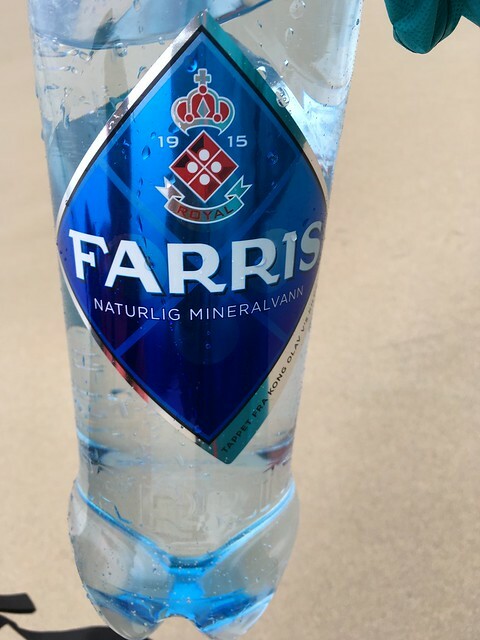 I drank the water, both from the lake and the tap, untreated for 7 days straight, and have yet to suffer any distress. The snow melts really fast in July! Chasing Mastery has some great information. As usual, Steph Abegg’s two reports are unrivaled for climbing detail. 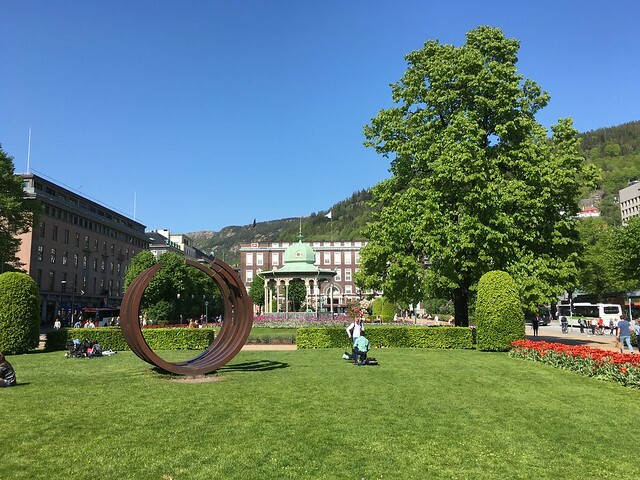 Bergen is the most popular place in Norway and tourism related services are around from the moment you exit the airport. A constant bus service takes you to downtown and is so busy that you often have to wait a few buses. We got dropped of near Festplassen and walked to Citybox Bergen, where we’d stay for the next 2 days. This is another one of those self-serve hostels that seem to be popular in Scandinavia. The hotel was OK, but I would not recommend it if you intend to do most of your cooking. There was no kitchen, just a microwave and a fridge and plastic utensils. 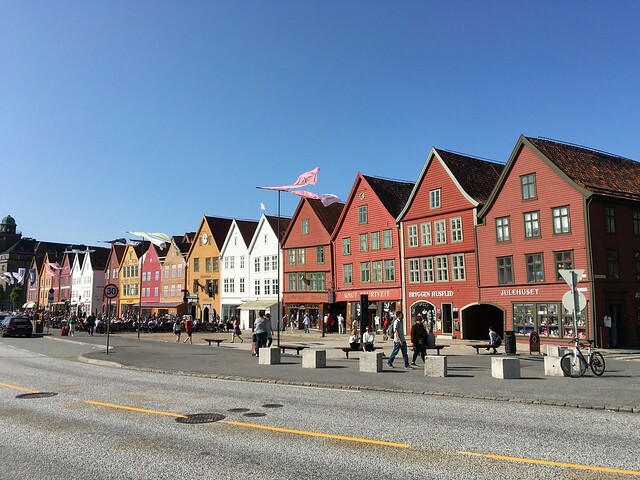 Since it was only early afternoon, we started the slow re-integration into society by visiting the one square kilometer where all of Bergen’s tourist activity seems to be; the area around Festplassen and Bryggen. Neither Bryggen, nor the fish market are as good as the hype. We were “done” with Bergen pretty quickly. We went to the tourist information center at the south end of the fish market for information about hikes we could do and to get tickets for the journey back to Oslo. 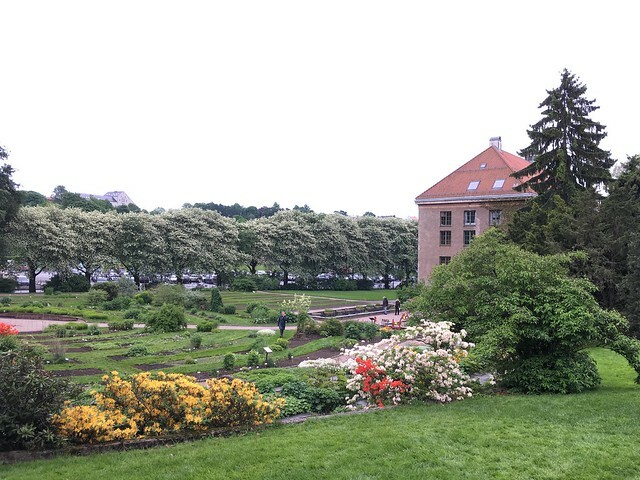 A quick walk around Bergenhus was enough sight-seeing for me for the day. I was ready to take a brief diversion into food. First, a stop at the famous Trekroneren for a hotdog. Hotdog at Trekroneren. 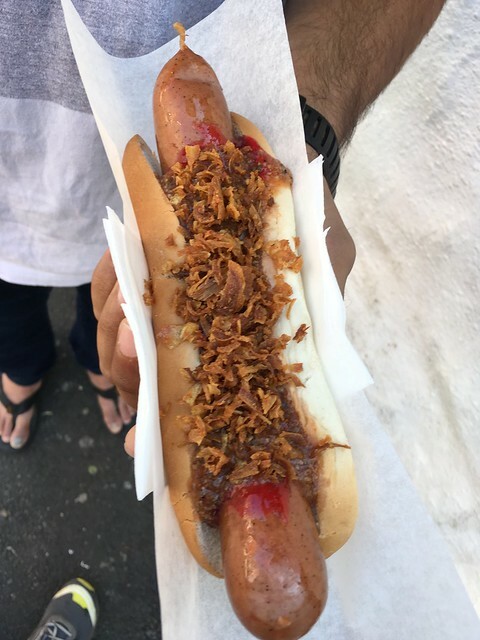 : Reindeer sausage with lingonberry jam, curry sauce and grilled onion bits! I have a soft spot for lingonberry jam, and will always eat it when available. The sausage was nothing special, my other experiences with reindeer have been much better. 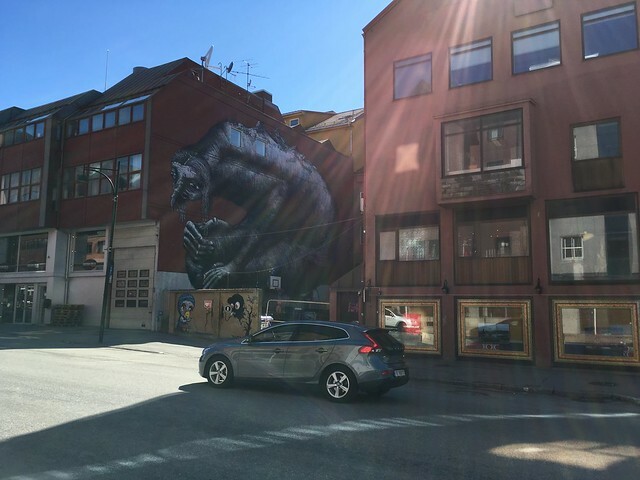 We ambled down the thoroughfare of Christiesgate towards the shopping district on Nygårdsgaten to get a better feel for the city, then ducked into a KIWI to get the next several days of food. KIWI cashiers actually have a neon green uniform, which is hilarious. Amazing juxtaposition of water and mountains. Pristine nature preserved alongside a very 21st century civilization. The best norwegian food? 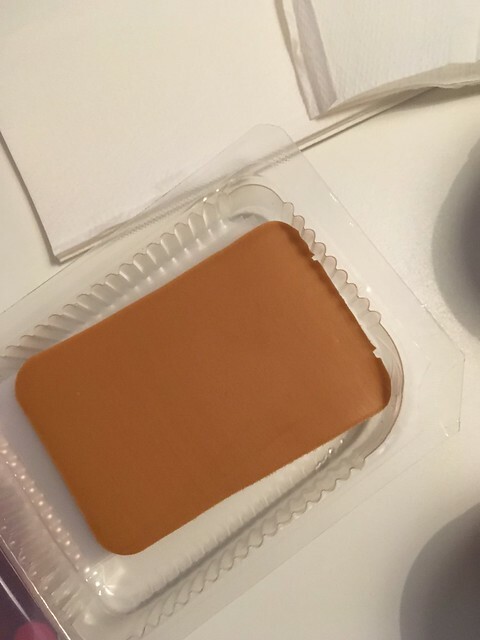 : Brunost sold me onto Norway. Room temperature kulfi. 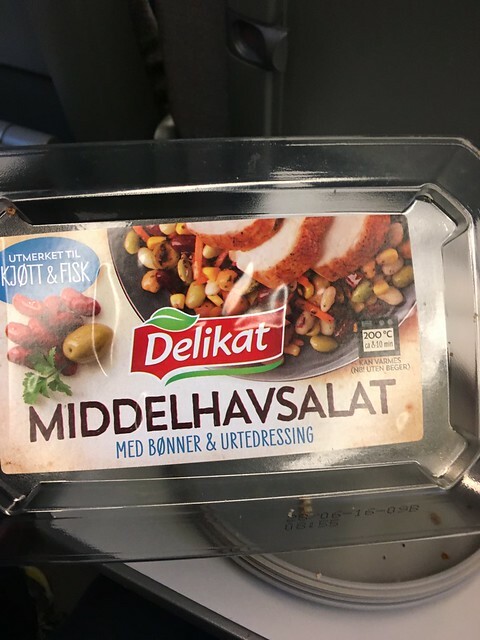 This unassuming “cheese” is apparently a norwegian speciality, is hard to find anywhere else, and seems to be an acquired taste. Through translated to brown cheese, it is actually caramelized whey, and is available as slices or blocks. I should’ve bought a block. A Norwegian even came up with a cheese slicer so they could enjoy this food forever. The best way to describe it is a really creamy, room temperature version of malai kulfi. It tastes great! 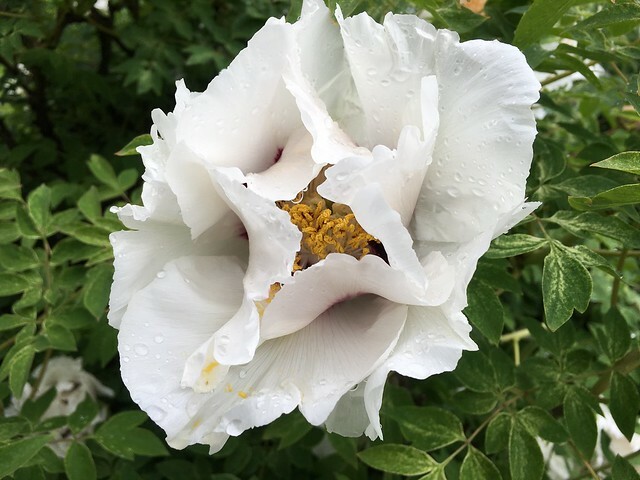 I ate it as is, put it on bread and jam, ate it as a snack, ate it as part of a meal, and brought several boxes home to spread the discovery to family and friends. Really, this thing was responsible for 25% of my general happiness in Norway. Fortunately, I may get my hands on some more soon from a friend of a friend. 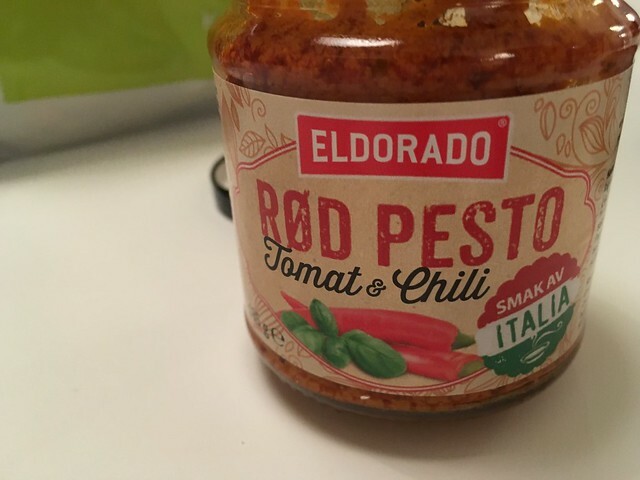 Other great grocery store food includes garlic mayo, Eldorado pesto and a kind of bean salad. Eldorado really knows their prepared food: The pesto and the soup were excellent! 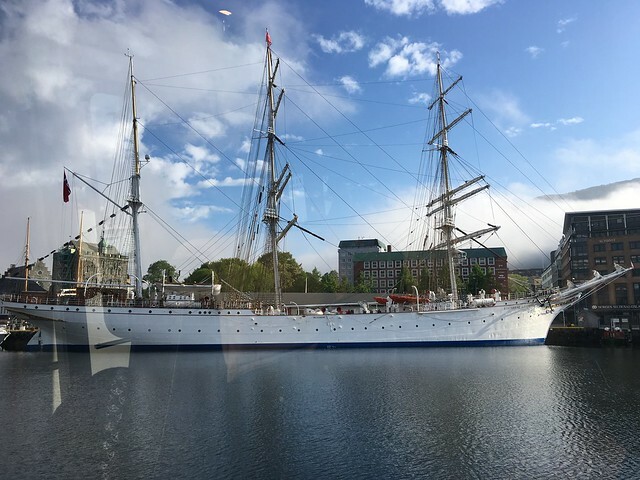 On the last day, in Oslo, I also had lunch at Restaurant Schrøder. It was very “Scandinavia trying to survive the winter”, that is, it was great. 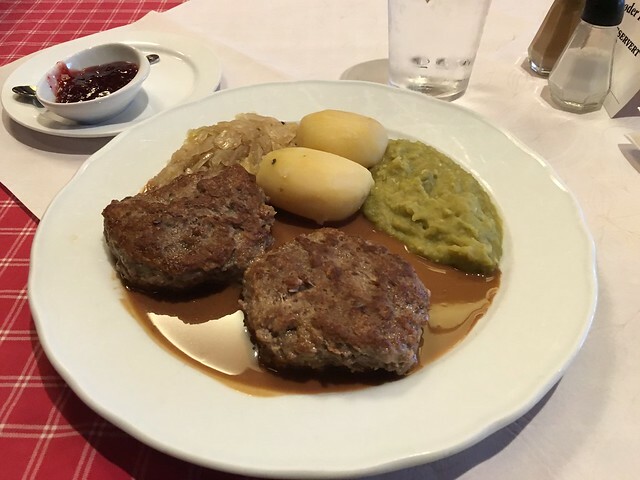 Reindeer meatballs: With potatoes, cabbage, peas and lingonberry jam at Restaurant Schrøder. 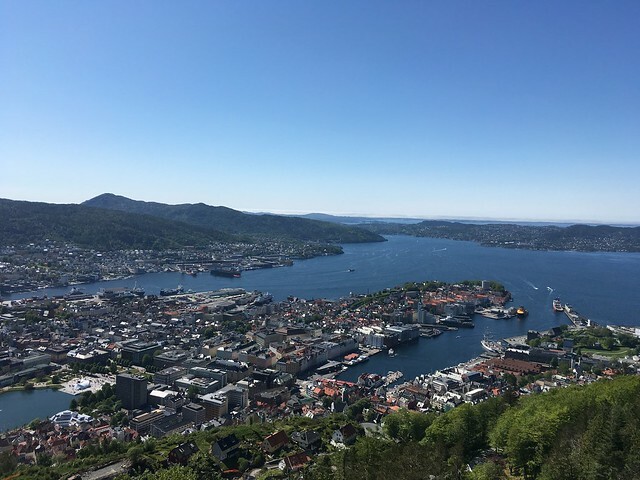 Ah… back to Bergen. It was some NOK60 to get us a one-way bus ride to Ulriken. 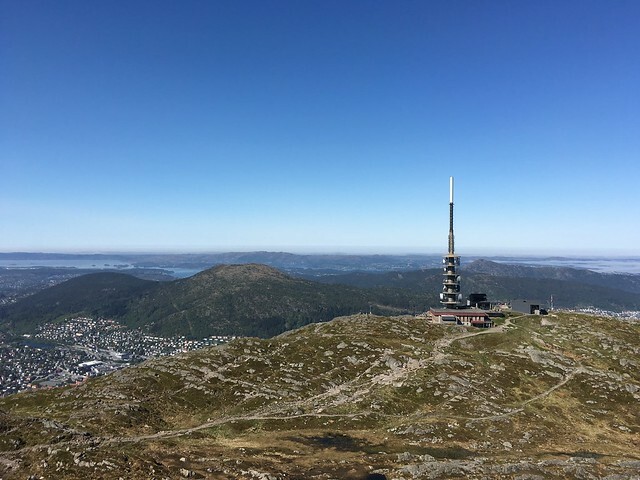 The cable car takes you on a scenic ride to the top of Ulriken, one of seven mountains surrounding Bergen. 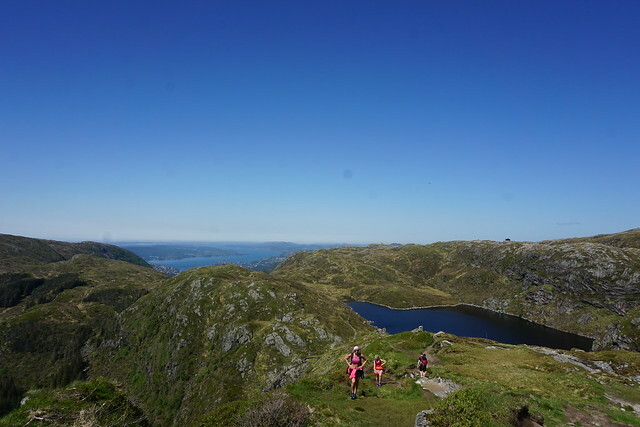 Several trails start from here and wander all over the general Bergen area. This was very similar to the Marin Headlands in San Francisco, but I was envious of the accessibility. 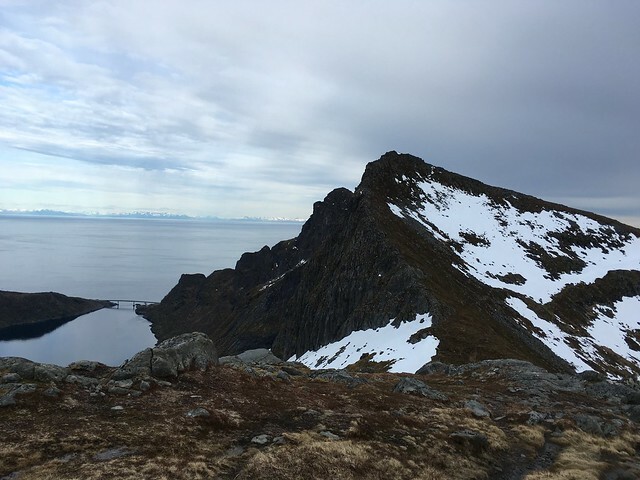 We first walked up Ulriken’s summit, then started on the Vidden trail. It is supposed to be 13km, but it seemed to take much longer. The trail is fairly flat and very well marked. There are plenty of huts along the way, and wild camping is permitted too. 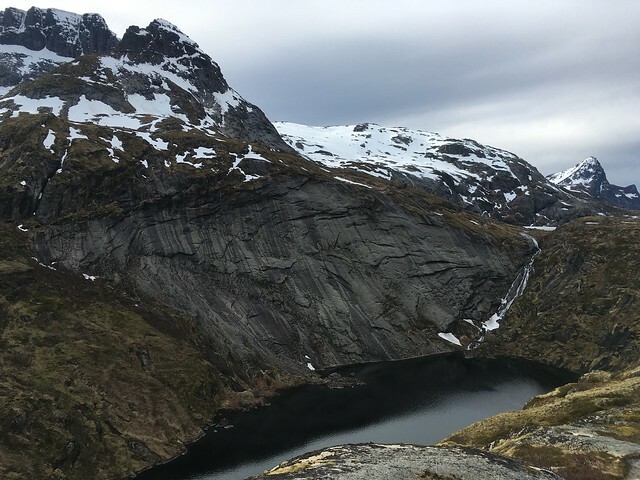 In my opinion most of the trail isn’t very special, it is only the sections near the lakes that really bring out the “this is Norway” aspects of it. Emergency cache on the Vidden trail. You eventually reach Fløyen, a smaller hill that is closer to town, and consequently has a lot more tourists. Nearing Fløyen on the Vidden trail. : This could easily be in a brochure for Bergen. The Floibanen down to town is a fun ride on a funicular. 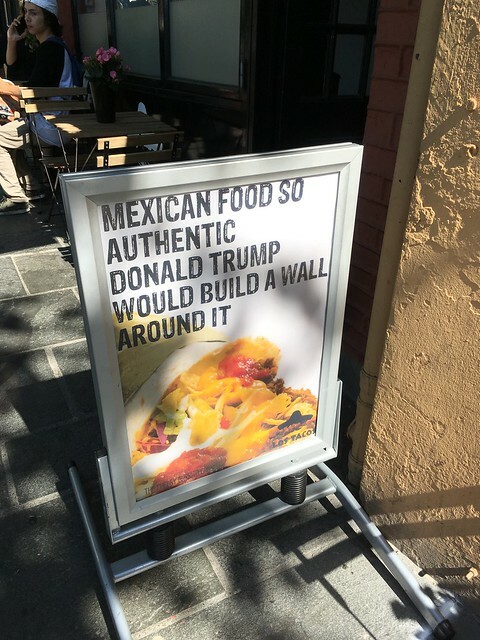 In Norway, Donald Trump memes make good advertisements. With the trip coming to a close, it was time to become a normal tourist, no more hiking unreasonable distances! 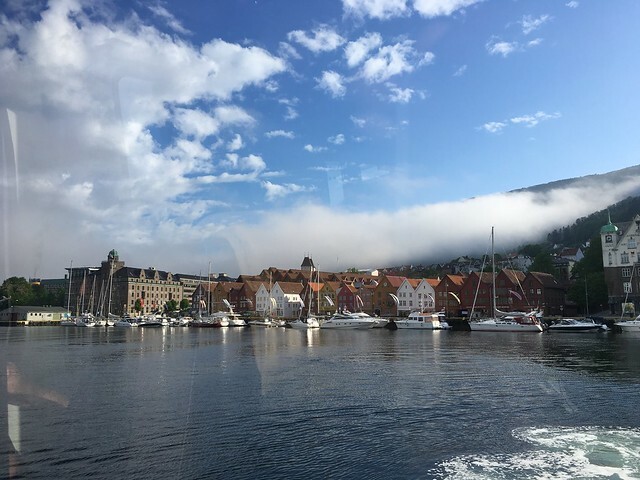 On the third day in Bergen we took the Norway in a Nutshell (the Sognefjord variation) package to get us to Oslo. 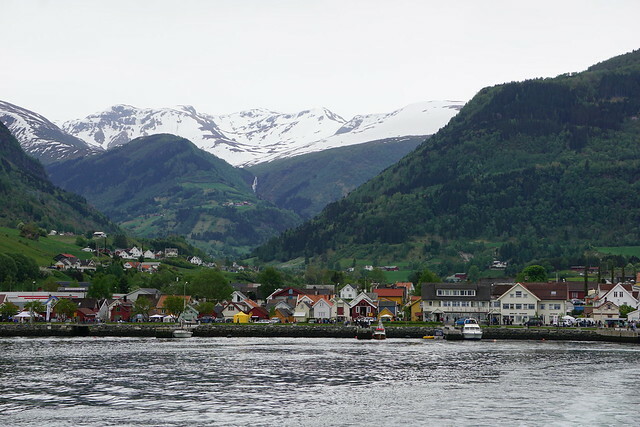 First up, a boat ride from Bergen down the Sognefjord to the town of Flåm. 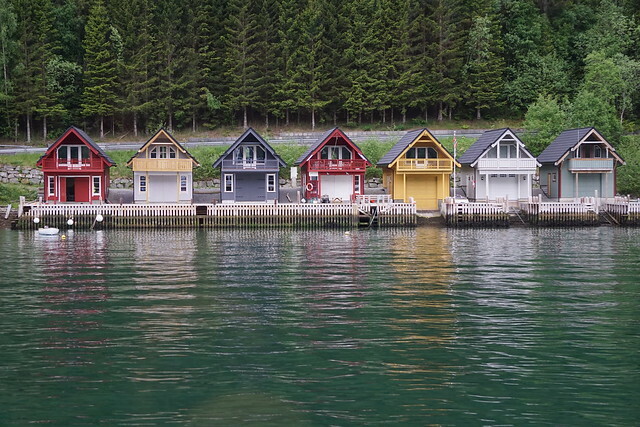 Tiny settlements sailing out of Bergen: Thousands of these tiny houses dot the fjords and inlets around Bergen. A massive old sail boat. The last bit of sun for the day: A little sunshine greets us as we enter the Sojnefjord. 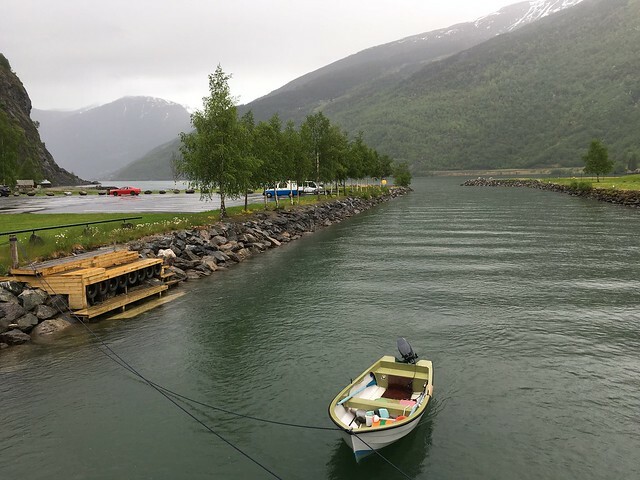 The weather quickly proceeded to become dreary, but the fjord was still delightful. 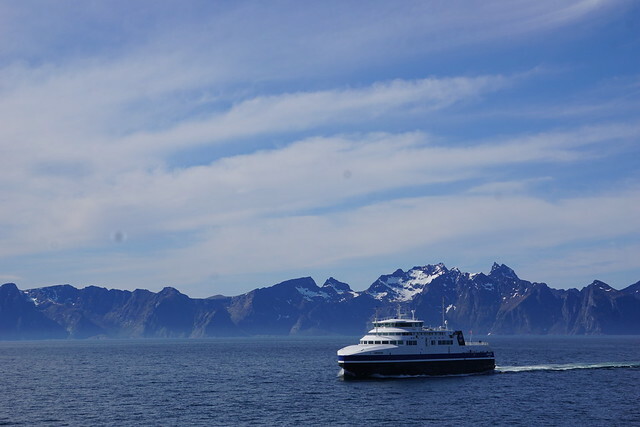 At Vik, we departed, then had to go back because one kid forgot to disembark. 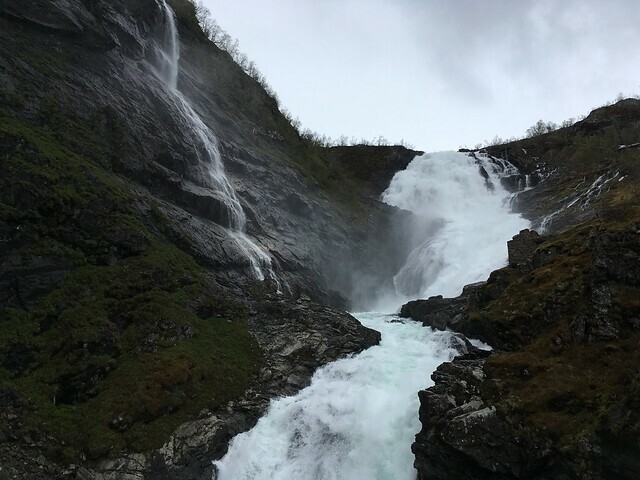 The waterfalls are everywhere along the fjords, but the one near the mouth of Naerøyfjord is particular magnificent and the boat takes you very close to it. 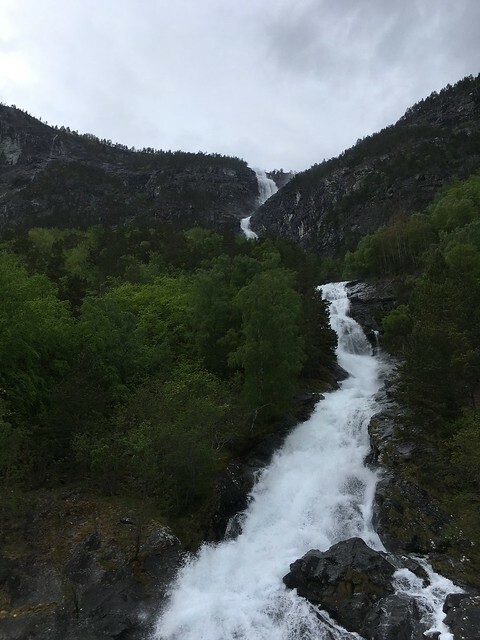 In another 20 minutes you are dropped off at Flåm, a town that has some tacky souvenir shops, restaurants, lodging and the terminus of the famous Flåm railway. They have Wi-Fi here too! We spent 2 hours waiting for our train. It was drizzling and some folks had to do the best they could to stay dry. 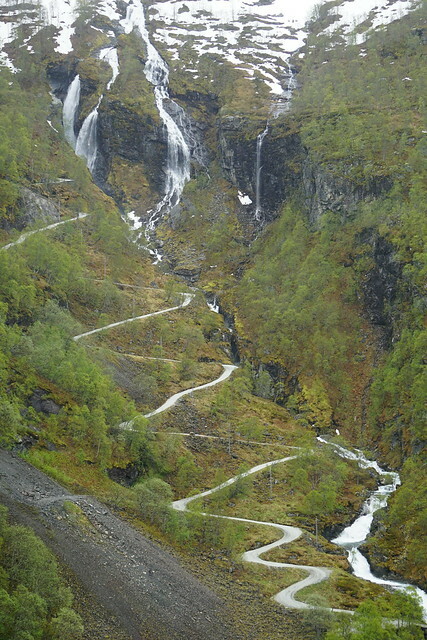 The ride down the Flåm valley is spectacular. Since the train is moving, the pictures don’t do it justice, it is significantly prettier than it seems. I would love to do a bikepacking trip here. 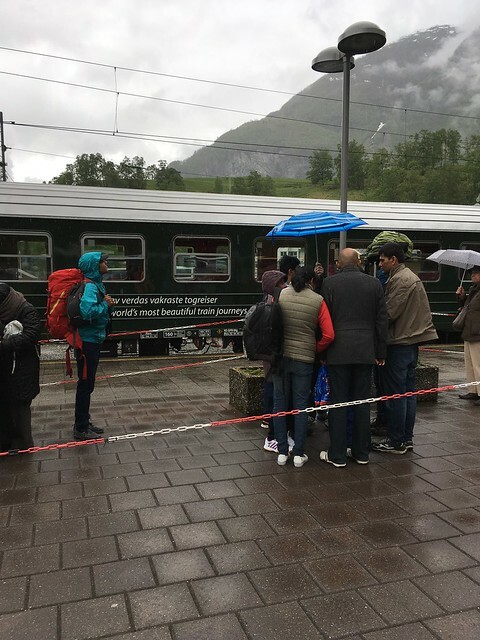 The train does stop at Kjosfossen, and they have a cheesy “show” where a lady dances in a red dress next to the waterfall. That was a bummer, as the waterfall is a spectacle in itself. 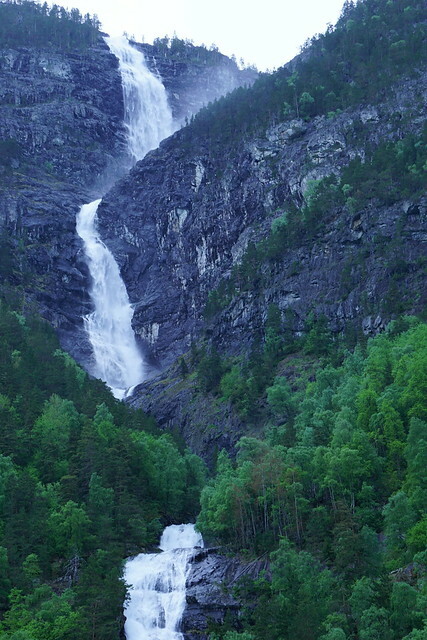 Kjosfossen: The biggest waterfall on the Flåm-Myrdal line. The ride is only an hour, but I wish they would slow it down to enjoy the sights more. We were dropped off at Myrdal and the end of the scenic aspects of the ride. From here we were on the main Bergen-Oslo train tracks. The train is really nice, brand new interiors and comfortable seats. For the first few hours it continues to wind its way through the mountains. 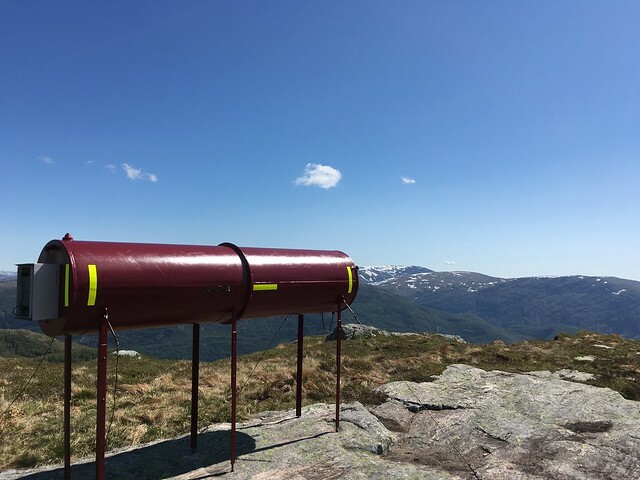 This is definitely on my list of places to come back to, because you can get off at a couple of different stations to make your way to the Hardangervidda National Park. By this point I had had sightseeing fatigue and was glued to my phone instead. We were eventually dropped of at Oslo Central at 10:30pm on a Saturday. Shreya left on Sunday morning and I walked around Oslo for a while. 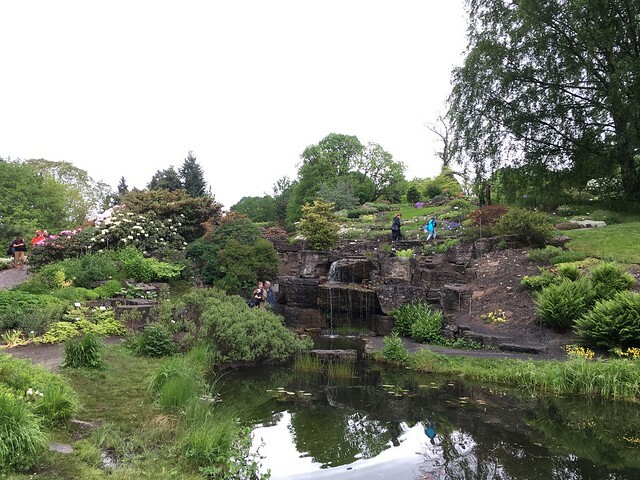 The botanical gardens were really nice. 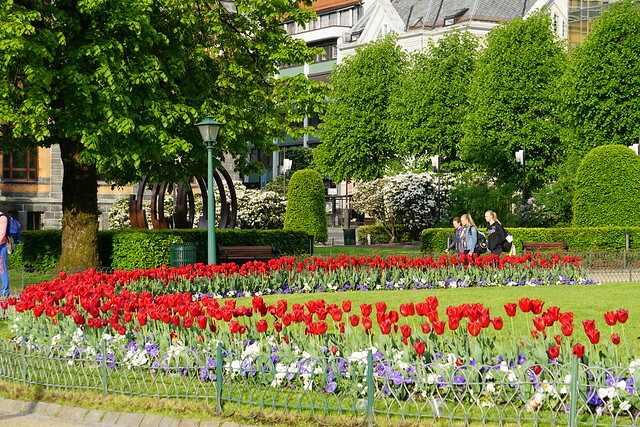 Tulips were in full bloom in other parts of the city too. Netflix Norway has The Dark Knight and The Avengers available for streaming, so I spent the afternoon watching all the action scenes, with brunost for company. It was nice to have a day of relaxing before heading back home. Constantly moving from one place to another is draining. On Monday morning I flew back to San Francisco, and the dependable sunshine of Northern California. This trip was a great introduction to Norway. I will be back. 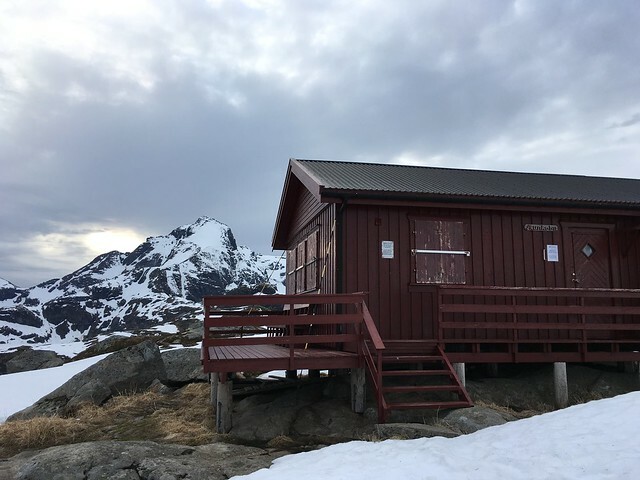 In particular, I want to spend more time in the Lofoten, go skiing in the Lygnen Alps, visit the Hardangervidda, and spend more time in the western parts of Norway visiting more fjords. It is definitely a country that needs time, partly because half of the days the weather won’t co-operate. But when the sun shines, it really does shine on some of the best places on the planet. I slept pretty fitfully that night, and not for very long. The sun had just from one corner of the sky to the other and my brain was confused. After an uninspiring breakfast (don’t worry, it gets better from here), we packed up and began the hike out. Munkebu hut has an incredible setting. Random waterfall on the hike out. The morning sun lent some spirit to the backdrop, but by the time we reached sea level, doom-and-gloom was back. About 1pm we dragged ourselves the 2km down E-10 through Tind, to the end of the road – the town of Å (pronounced “O”). I don’t know why the tourist websites make such a big deal out of it. It was just a tiny town with hardly any people. Perhaps it was just my state of mind, but between a very painful Achilles tendon, the dismal weather, and having finished my last fig bar, it was Å letdown. The little town of Å: Å i Lofoten - the full name - means "To the Lofoten". Fortunately, things were about to get better. In fact, I was about to have the most scenic few hours of my life. We spent an hour waiting at the bus stop at Å. There had been a landslide, leading to delays. The bus service that runs the length of the E-10 is also a school bus service and we took a short detour to the school. As we headed East, the clouds relinquished their grip and the Sun burst forth into the crisp Arctic air. We disembarked at was is surely the gas station with the best view in the world. Olstinden over Reine. : Gas station with the best views? Everything about the place was so inviting and comforting. Reinebringen and Olstinden towering over the sea, the tiny red houses under a warm sun, the burger and chips I ate at the gas station. My mood was on cloud 9. My favourite picture from the Lofoten. Shreya’s was more on cloud 8 since she couldn’t find anything she wanted to eat. 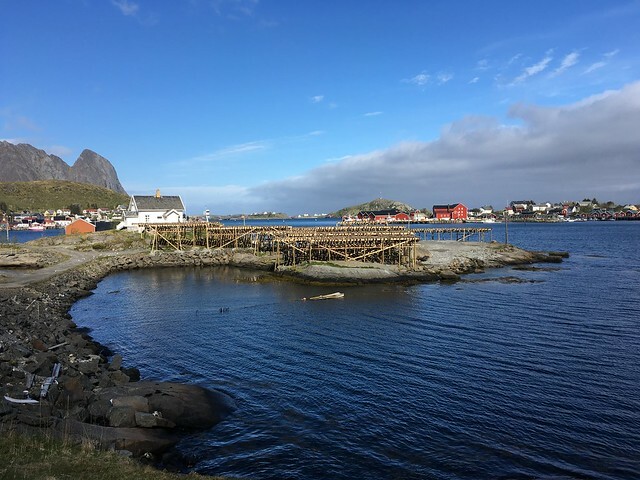 The towns of Reine and Hamnøy are very idyllic. Reine sentrum. 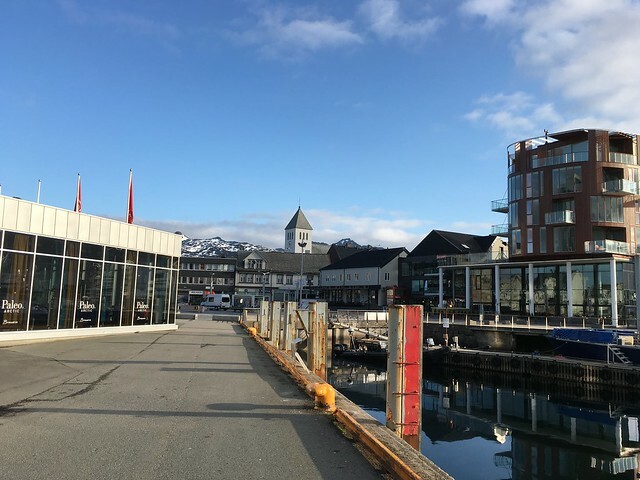 : About as downtown as you can get on Moskenesøya. 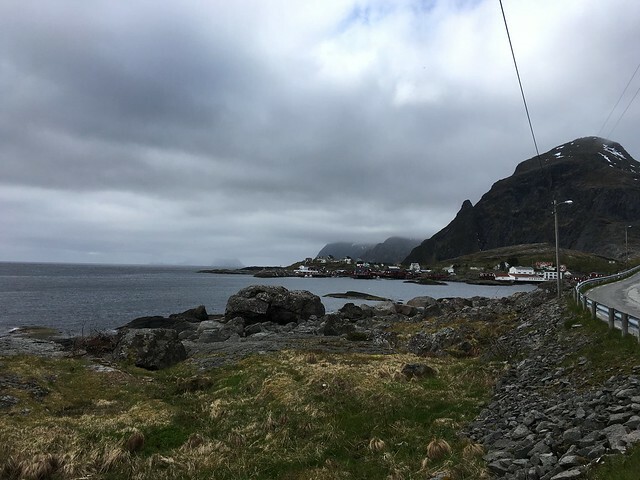 We had to make our way to the village of Hamnøy, about 4km away. Although exhausted, we also didn’t want to wait another hour for the bus, plus it was a gorgeous afternoon (have I made it clear yet?). I was hobbling the whole time, but wasn’t complaining too much because the views kept me distracted. All of this in just 2km of walking! Grass roofs anyone? 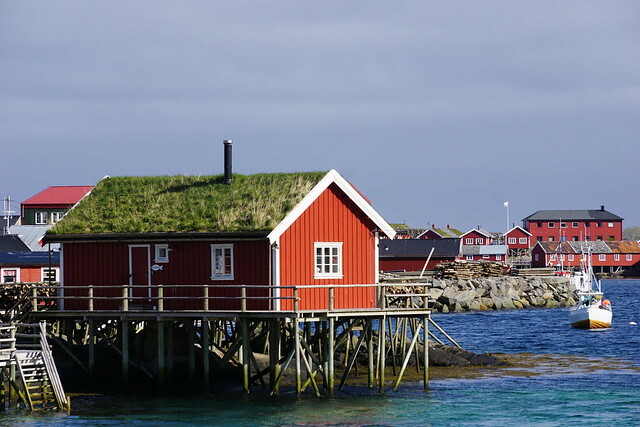 : A perfect specimen of the ubiquitous grass roofed houses. Reine sentrum is on a little outcrop that is connected to the main island only on the west. As we wanted to go east, we spent nearly an hour walking roundabout to get to the Coop market. Here we stocked up on more pasta, some fruits, eggs, and chocolate. 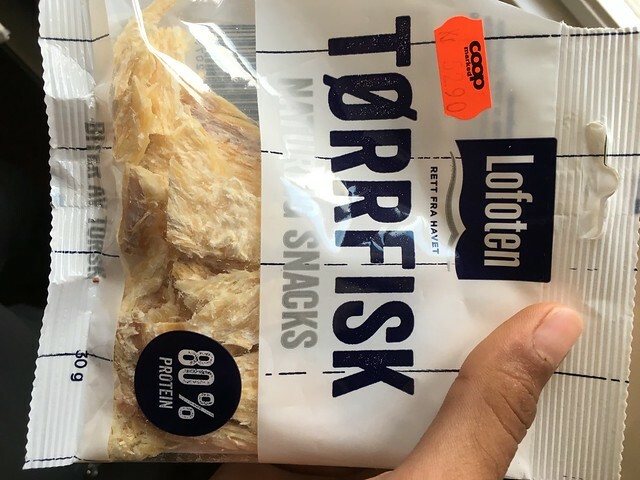 I also bought a snack size pack of the famous stockfish. 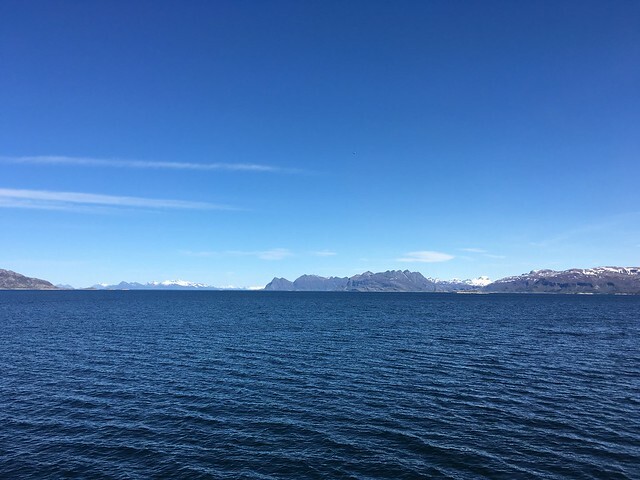 By the time we got to Eliassen Rorbuer in Hamnøy, we were saturated on deep blues. The rorbu are exceedingly cozy. There is a kitchen and dining space as you enter, a living room through a door, and a staircase which leads to the attic bedroom. Everything inside is very Scandinavian – clean lines and sharp finishes. The windows are tiny to keep the light out. The kitchen was well stocked with cooking essentials, including uncooked pasta. We ended up with too much pasta and tomato soup for dinner. Fortunately, they’d kept dark chocolate squares to wash things down. 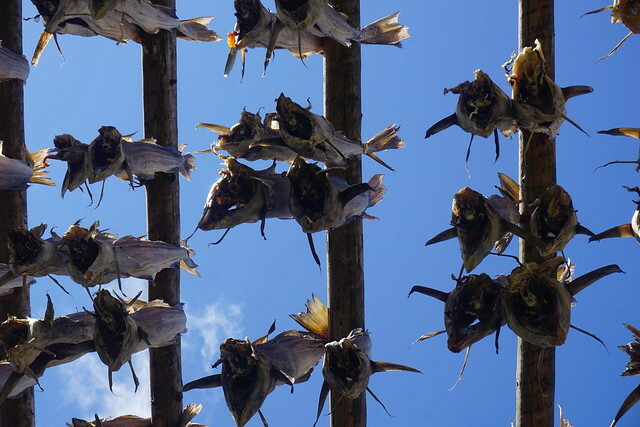 I must say, stockfish “jerky” is not to my taste. Not so appetizing after all. That afternoon walk and the stay in the rorbu easily makes the list of top moments in my life. Everywhere you looked was a world-class view. Eating dinner while Olstinden towered above was out of this world. Eventually the sleep deprivation of the last 2 days hit like a train-wreck and I slept for 10 hours. With the deficit paid off, we were ready for adventure again. You’ve to pay to play, and that means cleaning the rorbu! The clouds were back and it was drizzling by the time we checked out. We spent some time in the waiting area, where a Polish guy joined us. 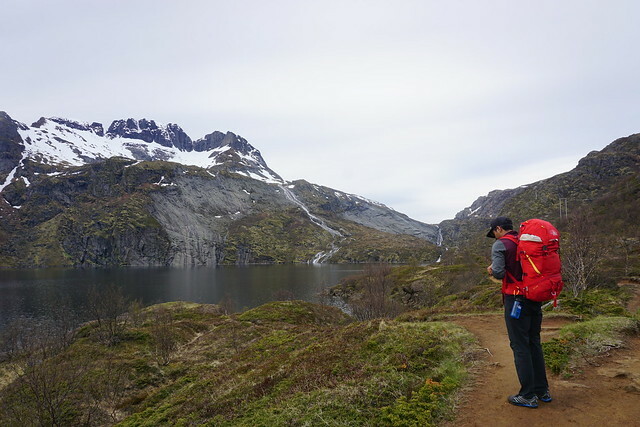 He had spent his whole time in the Lofoten lugging around a suitcase with a quadcopter in it! Quick note: While there is a westbound bus stop right outside Eliassen Rorbuer, the eastbound stop is a kilometer east. 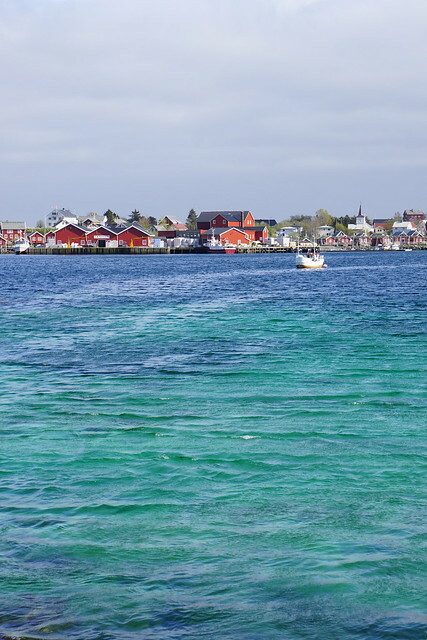 It is an hour’s ride to the town of Leknes. 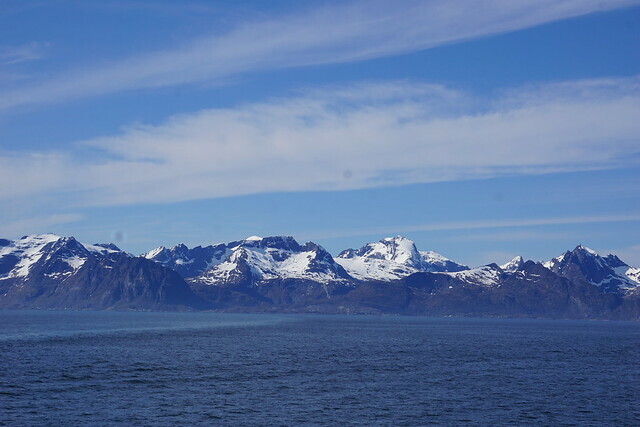 I didn’t pay much attention to the subdued scenery as we crossed over to the island of Vestvågøya. Leknes is the second biggest town in the Lofoten, and has stores and offices and traffic lights and things. We’d decided to use the next 24 hours to explore the parts of Lofoten the buses don’t go to. 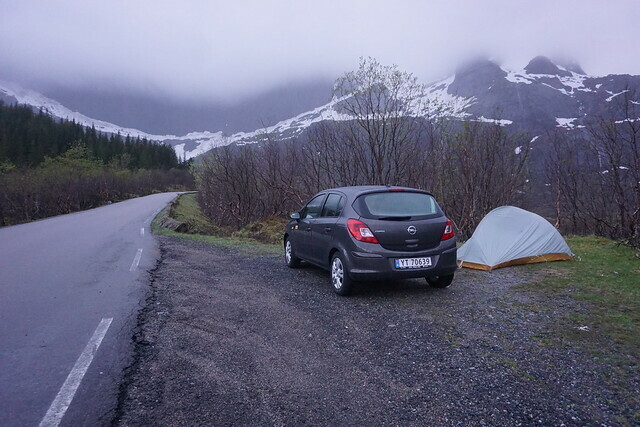 Since wild camping is allowed anywhere reasonable in Norway, we figured we’d rent a car and make plans as we went. After all, there was no threat of darkness looming over us. We picked up an Opel Corsa from Hertz (~$55). First order of the afternoon was Uttakleiv Beach, north of Leknes. Driving on Lofoten is nothing like California, the roads are narrow, you have to pull out to the side several times to let buses go by, and the tunnels are massive. Stick shifts are the default, so make sure you can drive one! 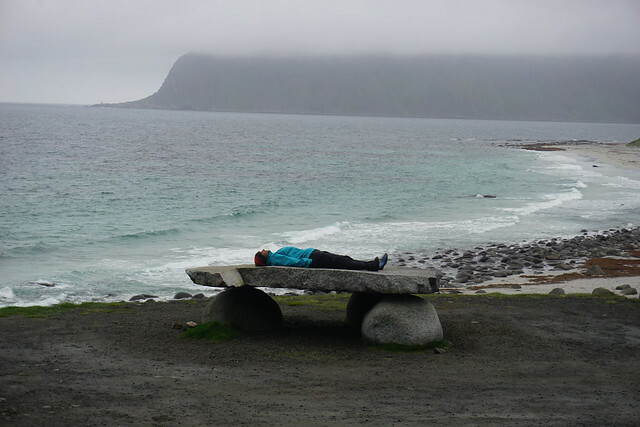 We made it to Uttakleiv by way of Haukland and both were windy and foreboding. Leave it to a Norwegian lady to go jogging on the beach at such a time. I’d rather be eaten by a troll. A troll's meal. 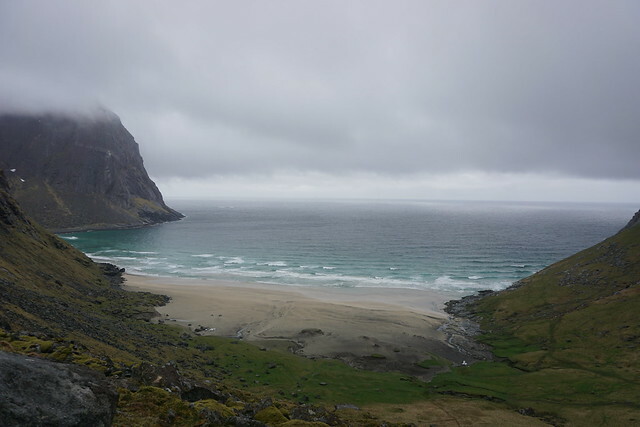 Uttakleiv beach. But seriously, the beach was beautiful. Just knowing that beyond this was nothing but the Arctic ice, added a visceral quality to the landscape. We drove to Ballstad, which I wouldn’t repeat in the future because there isn’t much there. 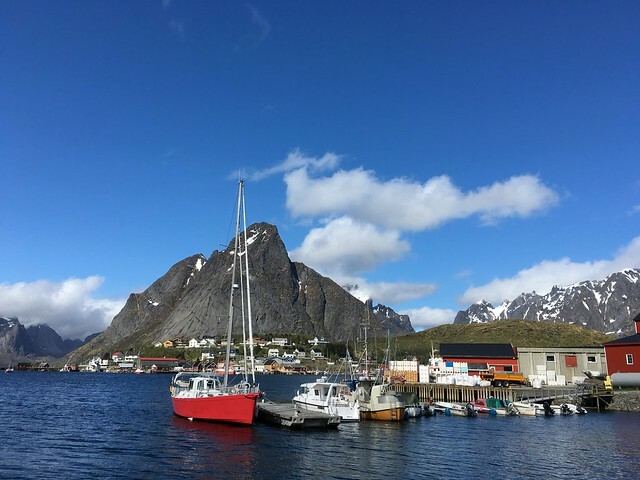 All the small towns in the Lofoten look the same, so you are better of going to the beaches and mountains. I did buy a bottle of mineral water from the store here. Bad idea! 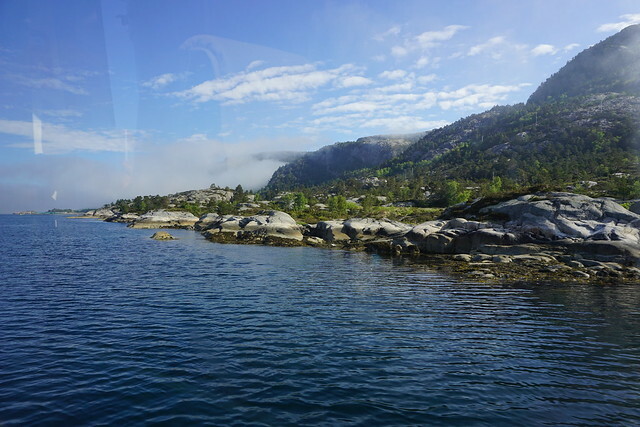 It was about 5:45 when we looped back to Moskensøya and made our way to Fredvang. Fredvang is a small town north of the E-10 that connects to it via two Hobbit bridges. We dropped off some French hitchhikers, then proceeded west. The twin bridges to Fredvang. We were here in search of Kvalvika Beach, which Cody Duncan highly recommends. 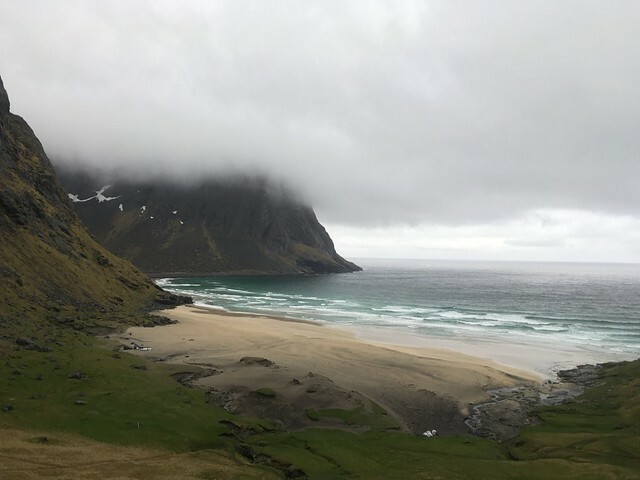 A small patch of pristine white sand, surrounded by 2000ft cliffs, Kvalvika is a delight in sunny weather, and mystical in the rain. The approach is muddy, but well worth it. The pictures don’t do it justice. 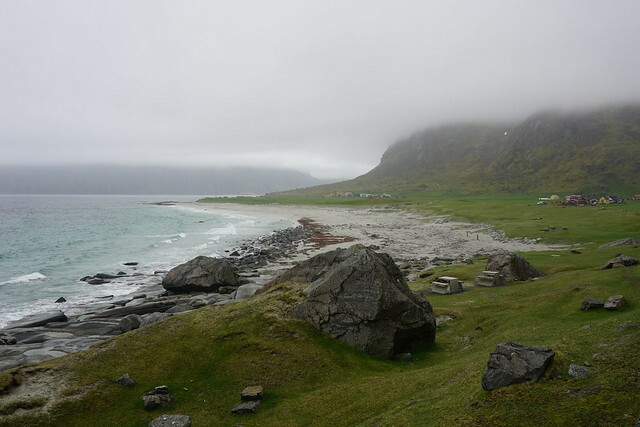 Kvalvika beach: Kvalvika beach is an absolute delight, even in rainy weather. The approach, the setting, the water, everything adds to its mystique. By the time we got back to the car, it must’ve been 9pm. It was time to find a campsite. While there were a few paid campgrounds on the E10, none of them looked very inviting. 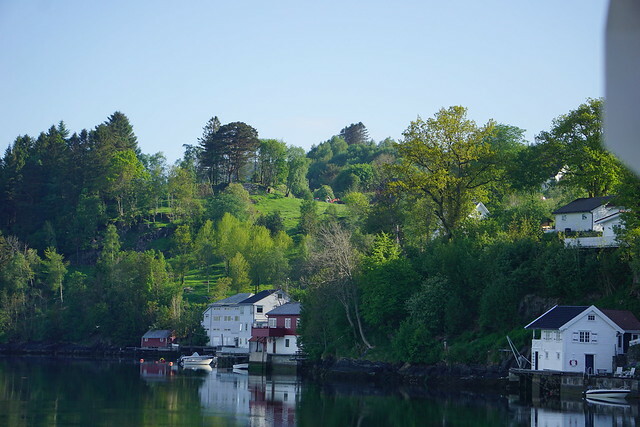 Instead we drove towards Nusfjord and found a pull out close to Storvatnet. Car camping with a view: Hard to believe it is 11pm! 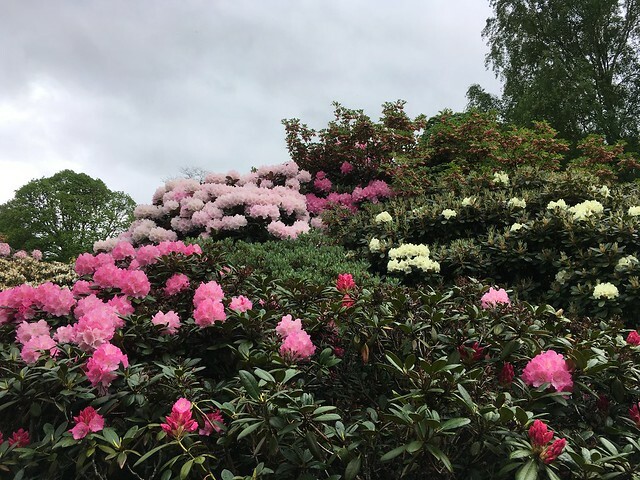 The next day the weather remained dismal, so it was a “get through it” day. We went to the Lofotr Viking Museum, which had some cool artifacts. It also had the cheesiest documentary I’ve seen. From there it was back to Leknes to return the car. 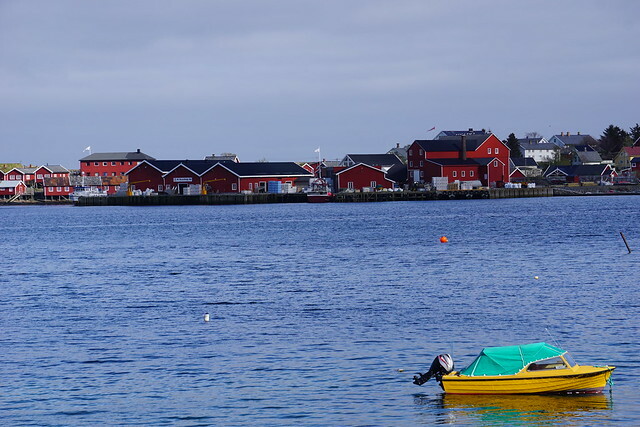 We grabbed a sandwich from a bakery, then took the bus to Svolvær. 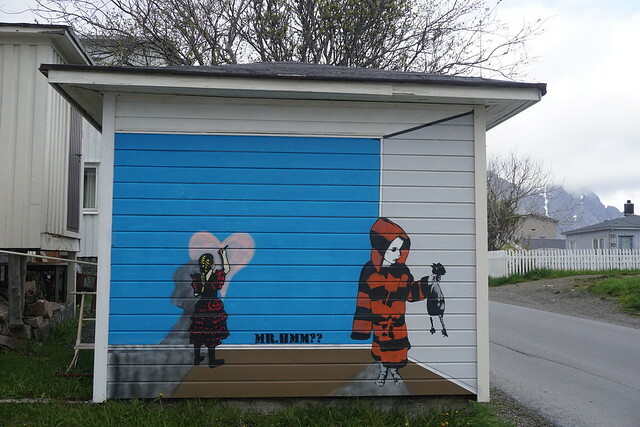 This is the biggest town in the Lofoten (Population: 4,487), but there isn’t anything to do really. We took a short bus ride to Henningsvær. 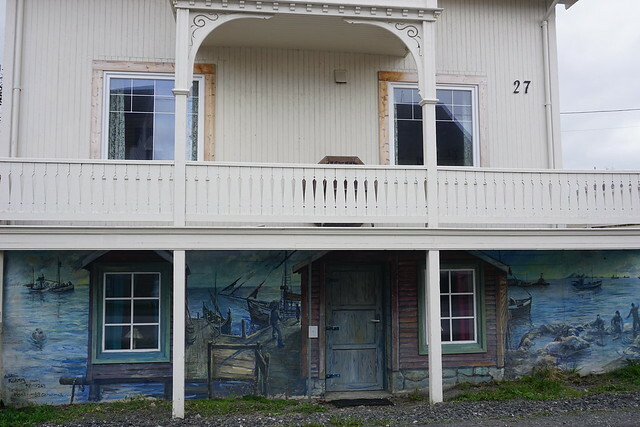 It has some quirky art but otherwise it is a sleepy town. 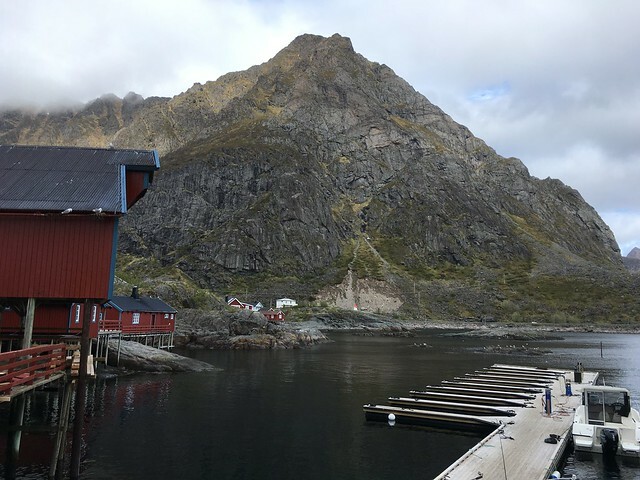 It seems Henningsvær is the center for climbing in the Lofoten, so I may come back later. We had dinner at Viva Italia in Svolvær; completely average. We still hadn’t figured out accomodation for the night. 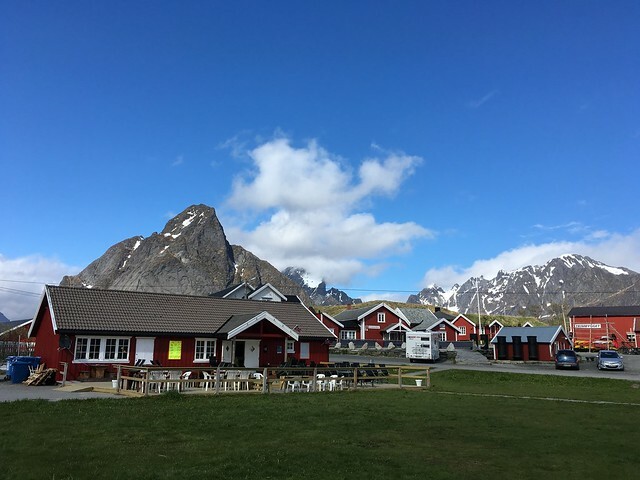 Turns out that Svolvær doesn’t really have any campgrounds within city limits and all the hostels were booked. We had to catch a 6:30am ferry the next day, so taking the bus to somewhere farther away was not an option. Fortunately we got a last minute room at the Fast Hotel Lofoten for <USD100. 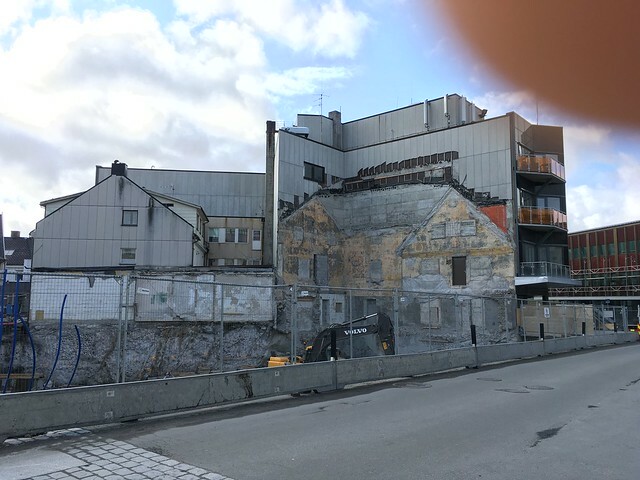 Svolvær might be the most happening place in Lofoten: Still boring. That concluded our Arctic experience. 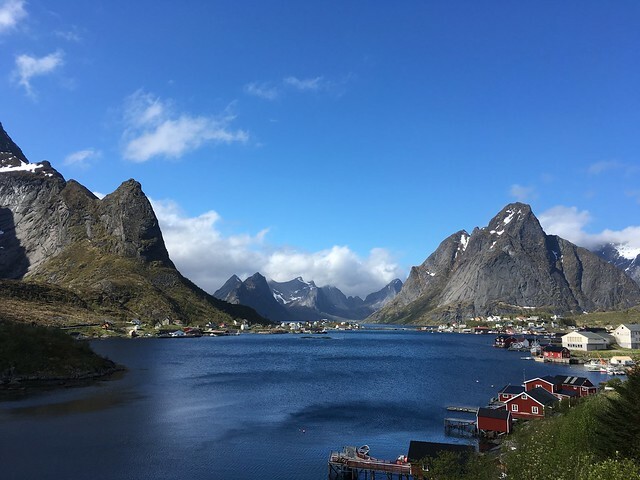 Lofoten was spectacular and I would love to go back. Do plan on going there with plenty more time. I would say, plan for rain at least half the time. Which means instead of rushing through, expect to stay 10-15 days. This gives you 5-7 days to enjoy the outdoors (hiking, backpacking, kayaking, climbing) and the rest of the days you can curl up to read in rorbu, RV or tent. That is what I intend to do. Getting there is slow and complicated, so you may as well make the most of it. Plus, they have great Internet access, so if you can work remotely, things will work out great. 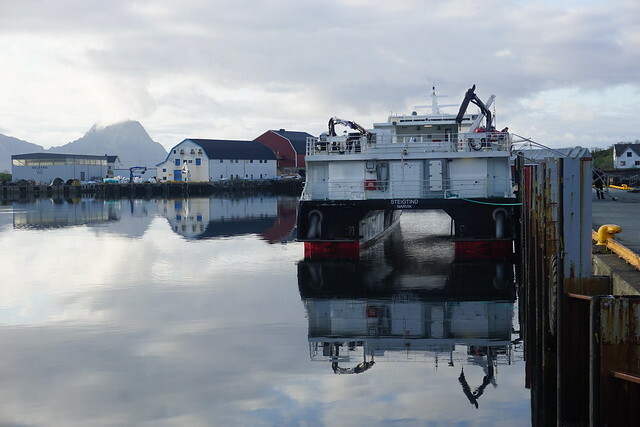 Steigtind at Svolvær: The express boat back to Bodø. 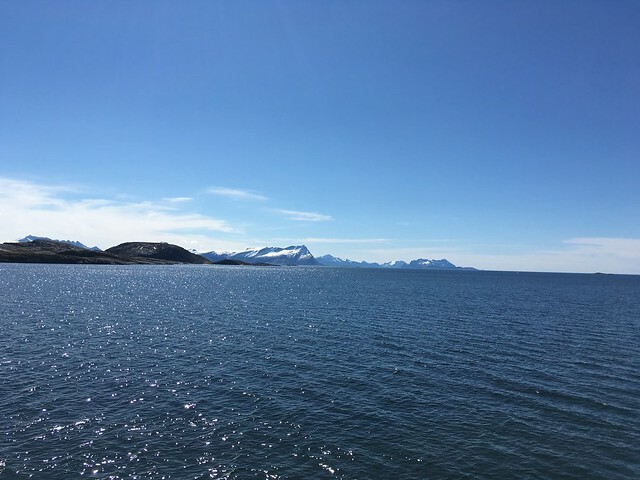 We took the M/S Steigtind, an express boat that makes several stops on the way back to Bodø. Again, Wi-Fi on the boat! How do these Scandinavians do it? Approaching Bodø, we were greeted by a set of F-16s on a training run. 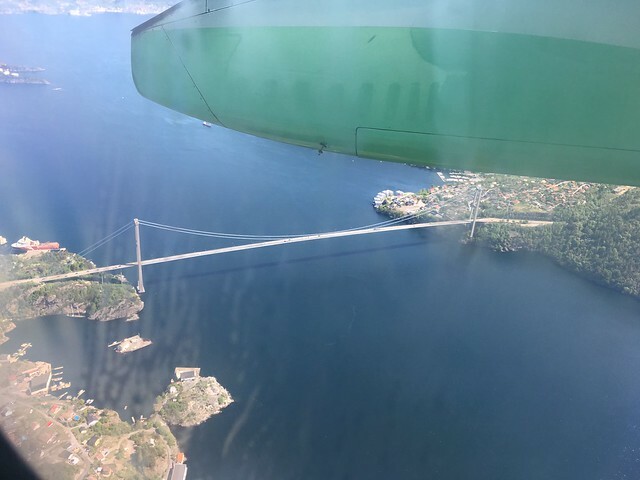 From Bodø, we flew Widerøe to Bergen. They have discounted youth tickets, which let me fly in USD106! 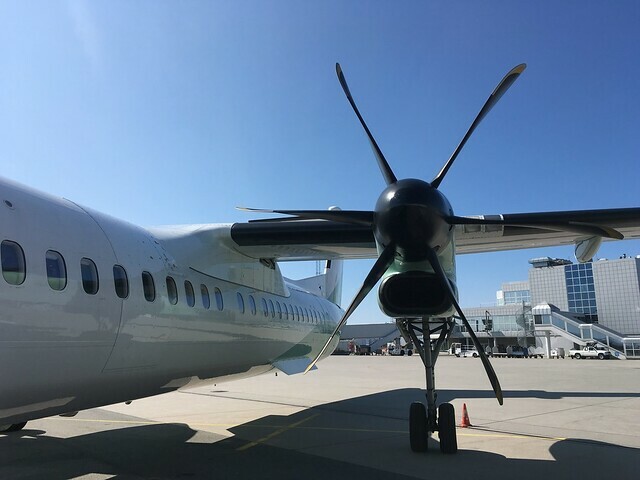 My second ever propeller plane ride. So excited! 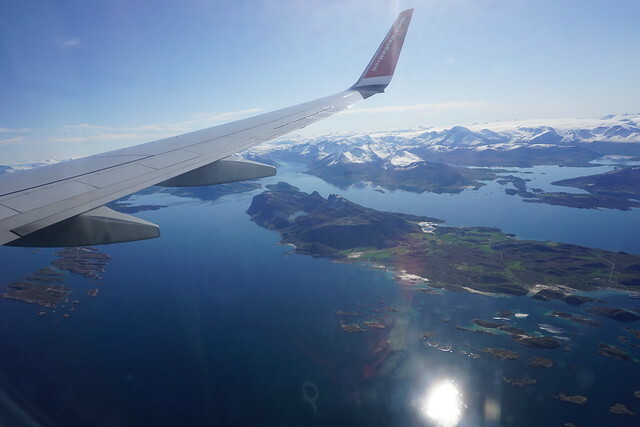 Flying out of Bodø was just as beautiful as before. It doesn’t seem like a bad place to live at all. Approaching Bergen we re-entered the bustle of the modern world. The freeways were busy, hundreds of boats moved in the fjords and large settlements were carved out between the sea and the mountains. Tourists were everywhere. It was time to see the better known parts of Norway. 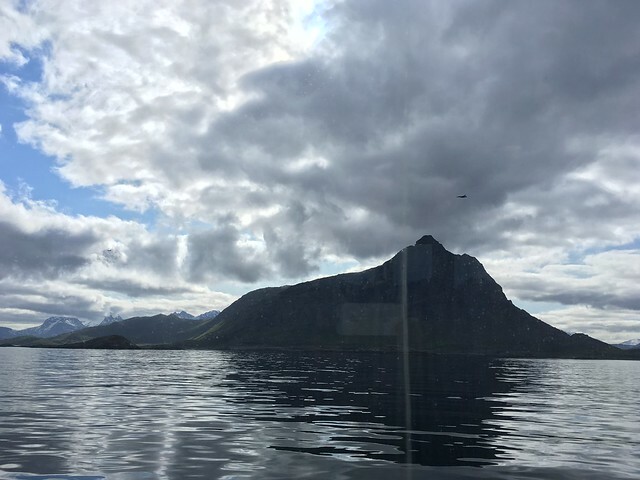 Norway Part 1: Josh Hartnetts beyond the Arctic Circle. 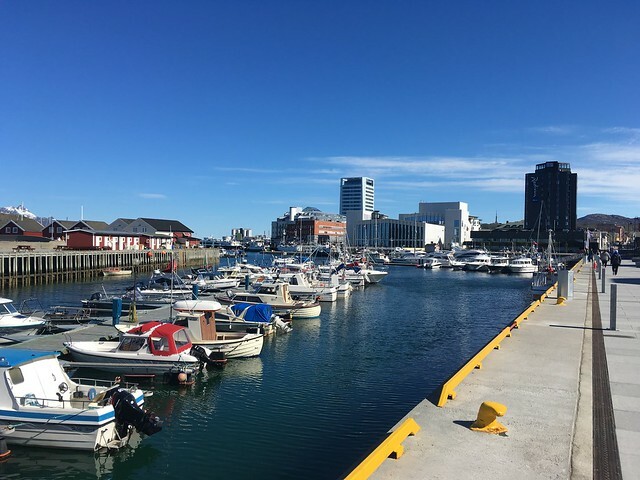 I went to Norway for 9 days the week before Memorial Day weekend. As is the norm, I was blown away by the pristine beauty of the country, and will certainly go back. There is some great climbing and skiing to be done in Norway in the future. 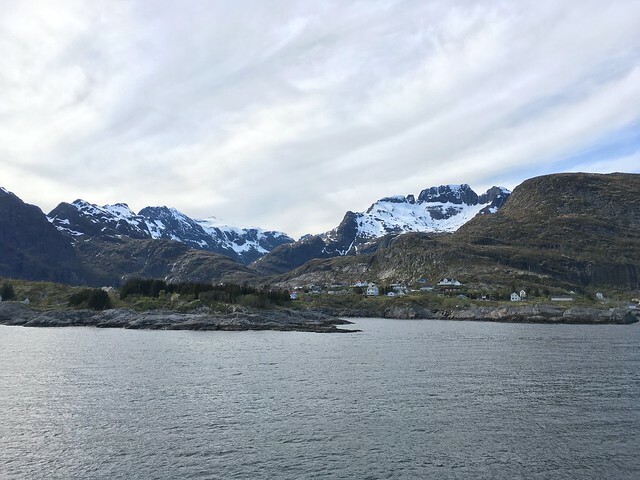 The highlights for this trip were 3.5 days spent in the Lofoten islands and the Sognefjord + Flåm tour. 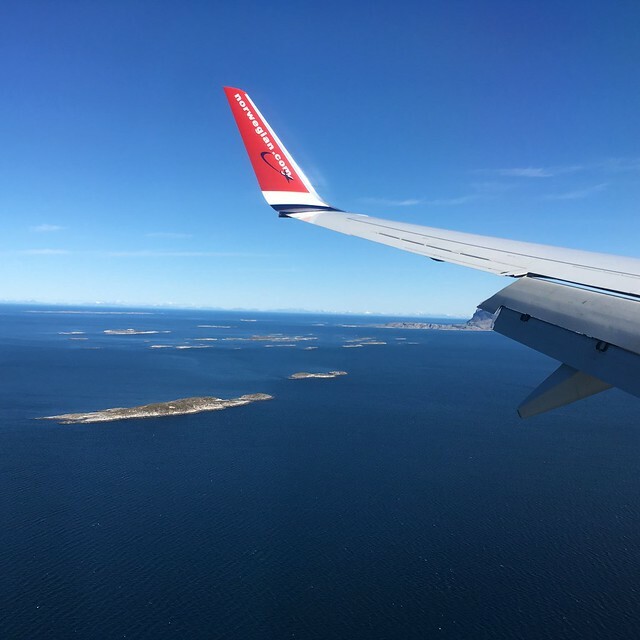 I flew SFO-AMS-OSL with KLM and landed in Oslo on the afternoon of May 21, 2016. The TSA was having a holiday and not making anyone take off their shoes or take out their laptops! There were a few moments at Schiphol when I thought I was going to lose my luggage, again! I could see my bag in the vehicle from the terminal, and the guy didn’t unload it at the plane the first time around. Fortunately he came back to deliver that one piece and keep my trip going smoothly. The Flytoget airport train to downtown is fast and frequent, and you can even pay by credit card directly at the turnstiles. I met Shreya at the station and we went to the Anker Hostel where we had a room. After a nap, it was time to do the most important thing when arriving in a Scandinavian country: buy groceries so you don’t get gouged by expensive restaurants! Pasta, green pesto, bread, cheese, garlic sauce (garlic mayo), baked beans and apples was the first run. Don’t forget the obligatory cookies. The food taken care of, we proceeded to walk around the center. 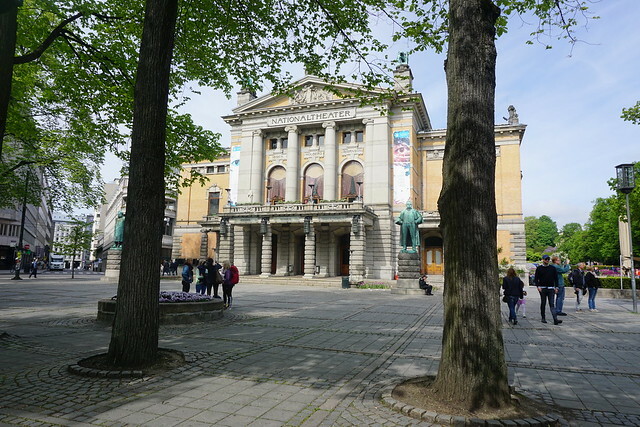 Oslo is not very interesting architecturally or socially. The colors are drab, and at least on that cloudy day, hardly anyone was in the streets. The opera house is impressive, but very out of place. The sinking ship/glacier is a nice touch though. 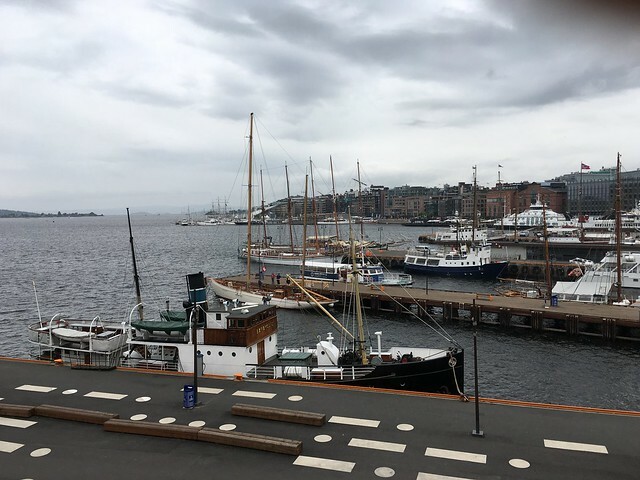 Oslo harbour: Another dull day in Oslo. The Norwegians have a different idea of meatballs. I must try these meatballs! 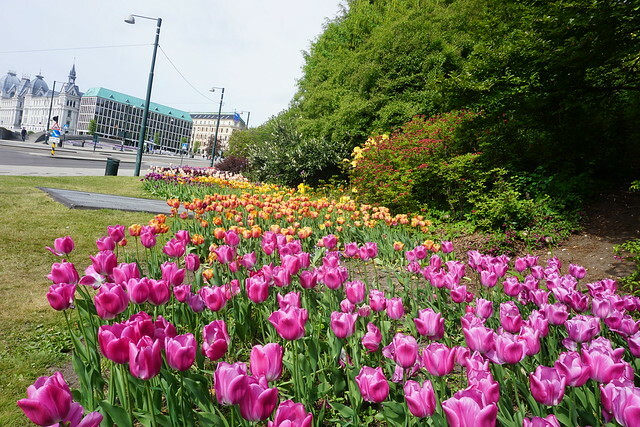 One thing Oslo was not lacking in spring was flowers. 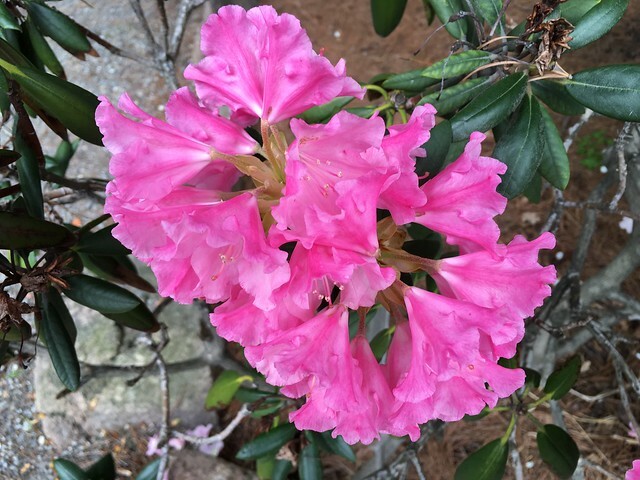 They were everywhere, and they were delightful. More of these will show up later. 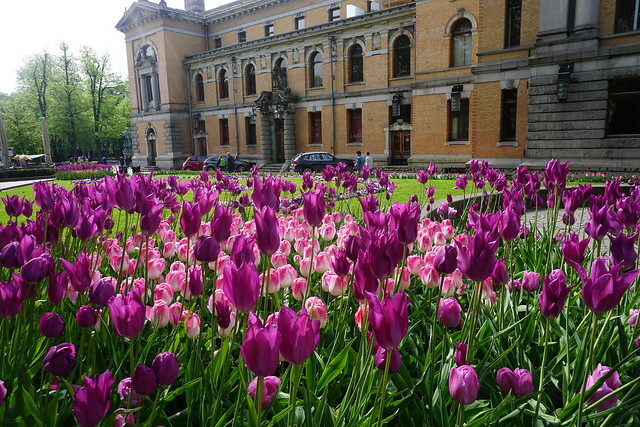 Tulip season: May is tulip time! The Anker Hostel had an in-room range for a pasta dinner. After that we tried to sleep in the weird half-evening light that hangs around this time of the year. The next morning it was back to the airport to catch an early flight to Bodø. The self-serve bag check was fascinating. I was looking forward to Bodø after this very interesting story about an SR-71 Blackbird landing during the Cold War. Although the story has nothing in particular about Bodø, exotic sounding places in far-off locations have that effect on me. It did not disappoint. 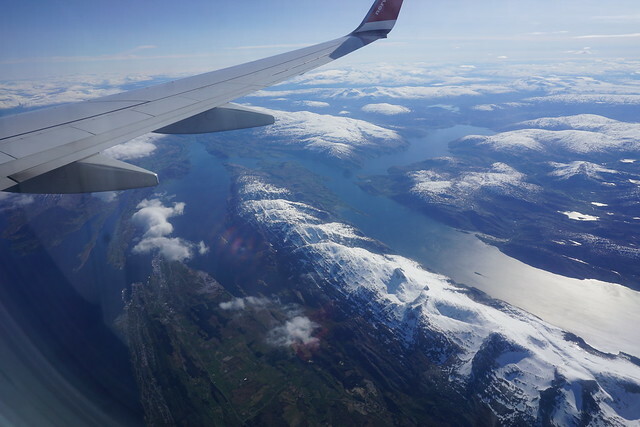 About 2/3rds of the way into the flight the weather cleared, and the Real Norway opened up. Blue seas, green islands, and jagged, snow covered mountains. 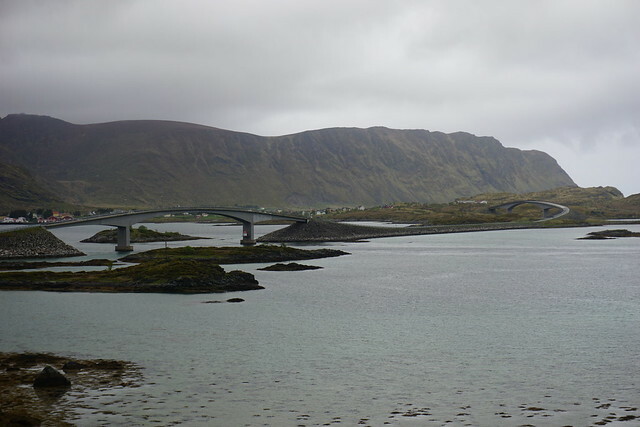 Fish farms, tiny roads that led to single houses in the middle of nowhere (private islands?) and occasional small towns. Even the small towns often had an airfield, a necessity in this fragmented landscape. 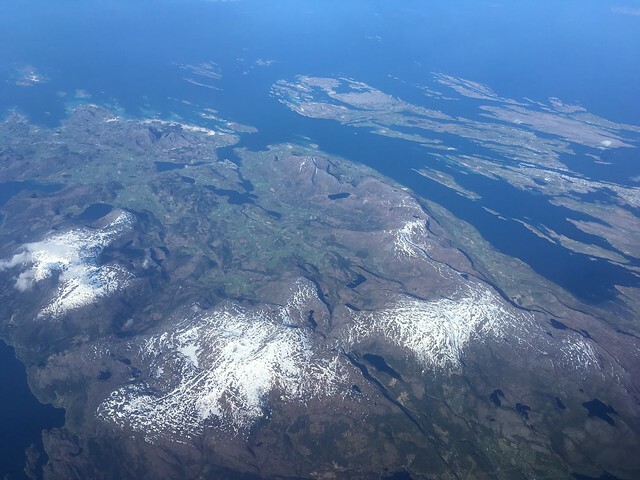 Flying to Bodø: Views from the left on the flight to Bodø. Islands and fjords while en route to Bodø. 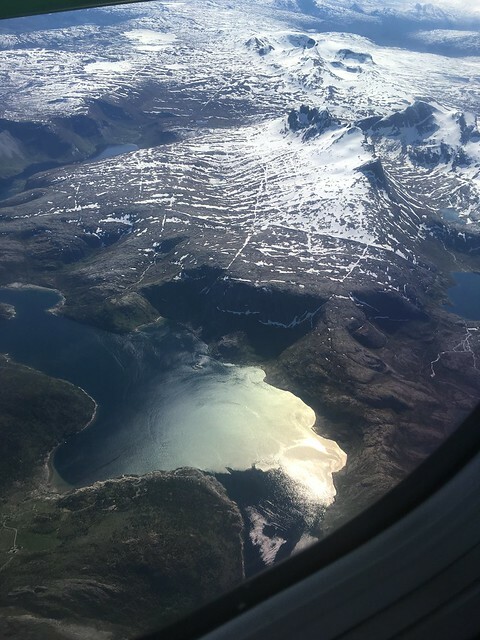 Views from the right on the plane from Oslo-Bodø. Already getting infected with Norway fever. 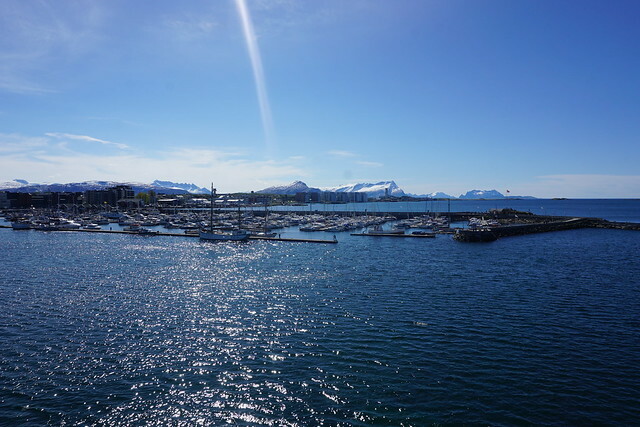 The town of Bodø: So picteresque I could spend a few days there. This place, with 50,000 people, has taller buildings than most places in the Bay Area. Bodø airport is small and just a 20min walk to downtown. We had about 3 hours for the ferry to Moskenes in the Lofoten. Unfortunately, it was a Sunday. This meant the most happening place in Bodø was the 7-Eleven store. The 7-Elevens in Norway are nothing like the dingy, gas station places I see in California. This one had a complete frozen yogurt bar, plenty of baked goods and other snacks. It had bright outdoor seating, and had more people (~10) than I could see in the rest of the street. I lost a few more kronor on a warm slice of pizza. Troll anyone? : Probably keeps the kids out of the alley. We continued walking down the coastline to the ferry terminal. The air is spectacularly clear so far North. 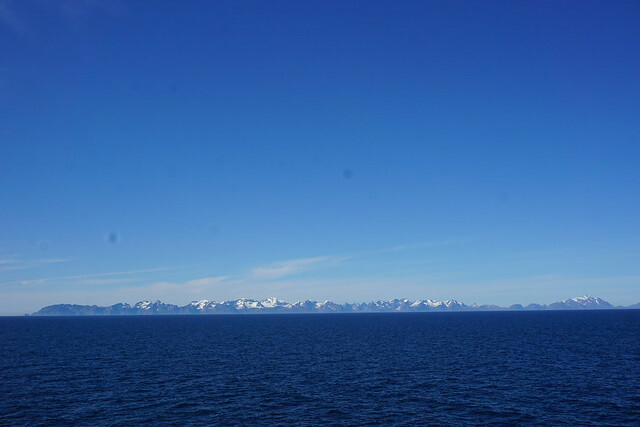 We could see the Lofoten wall across the horizon from a 100 kilometres away. 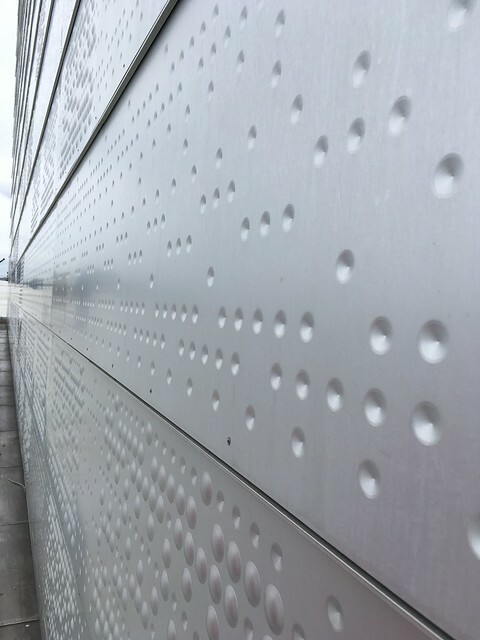 The Lofoten Wall: On a clear day, the Lofoten Wall is visible from a 100km across the Norwegian Sea. 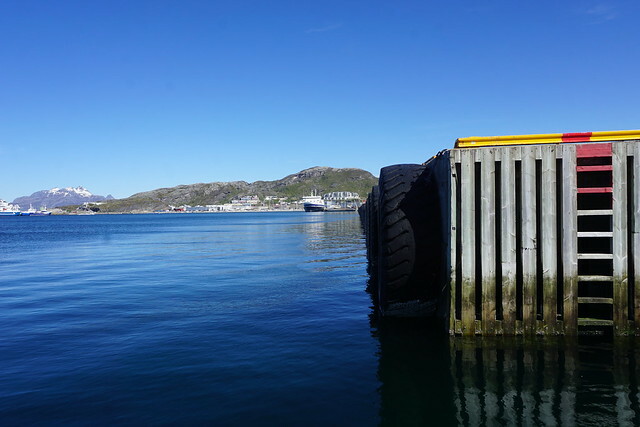 Seaside at Bodø: The M/S Værøy, our ride to Moskenes harbor, in the background. On the way out to the Lofoten we took the Bodø-Moskenes ferry which departs at 1pm. This is a car ferry. I wolfed through more garlic sauce and bread waiting for the boat. There were a few early risers here with us, and a couple of other backpackers we had seen on the plane. Waiting for the boat: The MS Væroy in port. Tickets are about NOK196 and there are 2 decks. We grabbed the upper deck that had the larger chairs around round tables. The boat filled up quickly. There were a lot of kids so far north, boisterous kids no less. While I appreciate the Norwegians letting their kids run around freely, even on a boat, the incessant chatter got old by the time we reached Moskenes. The boat ride was scenic, windy and listless, in that order. Every few minutes we would head out to get over the lethargy, take a few pictures, then be forced back in by the wind. 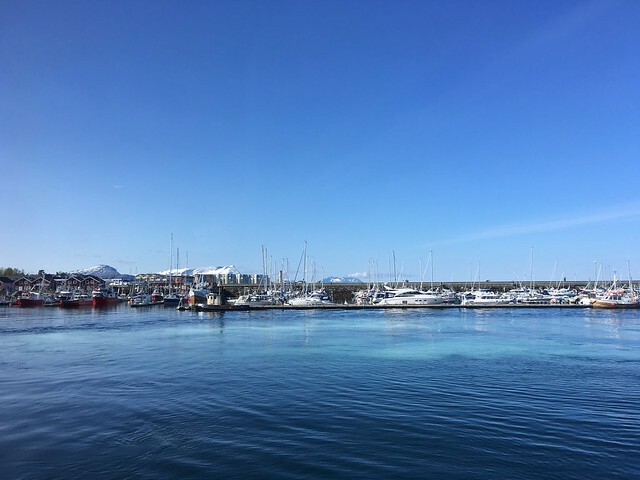 Bodø marina: Snow-clad peaks on a lovely spring day at the Bodø marina. 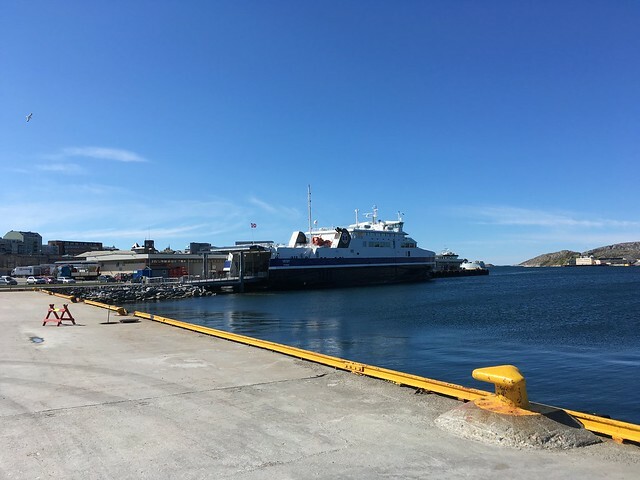 The ferry navigates around the twin islands of Little and Big Hjartøya and spills out onto the Norwegian Sea. The island of Landegode with Lofoten in the background. 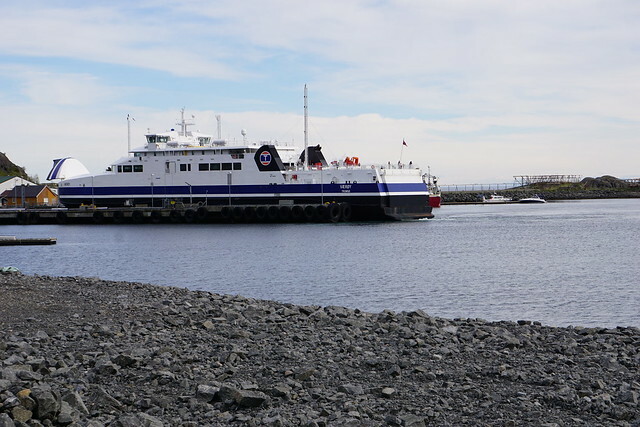 The other Bodø-Moskenes ferry: The "M/S Landegode" making the return journey. Mosken: The tiny island of Mosken between Værøya and Moskenesøya. 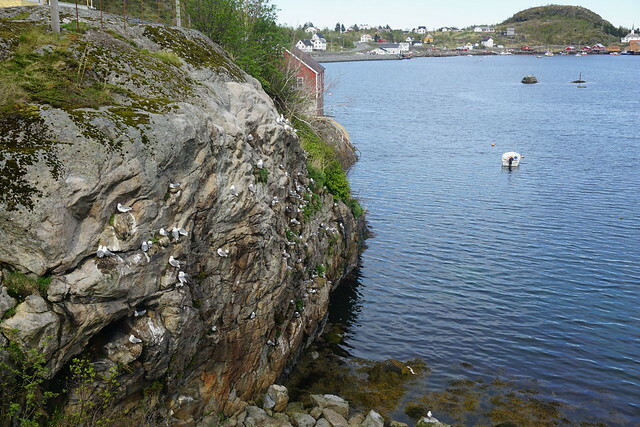 The Lofoten Wall stays constant, and the small islands of Røst, Værøy and Mosken dot port side. 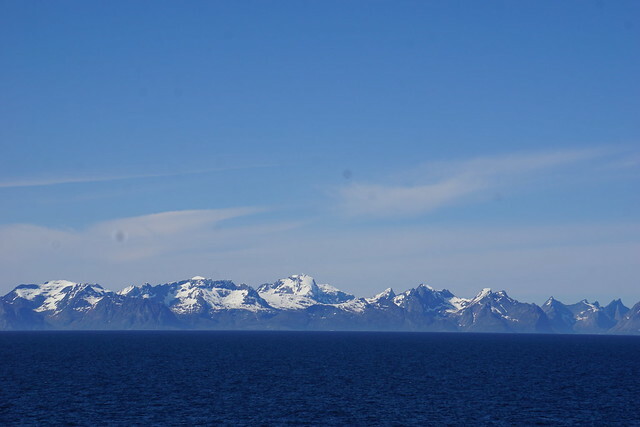 The island of Moskenesøya: Hermannsdalstinden, in the center, is the highest peak on Moskenesøya. 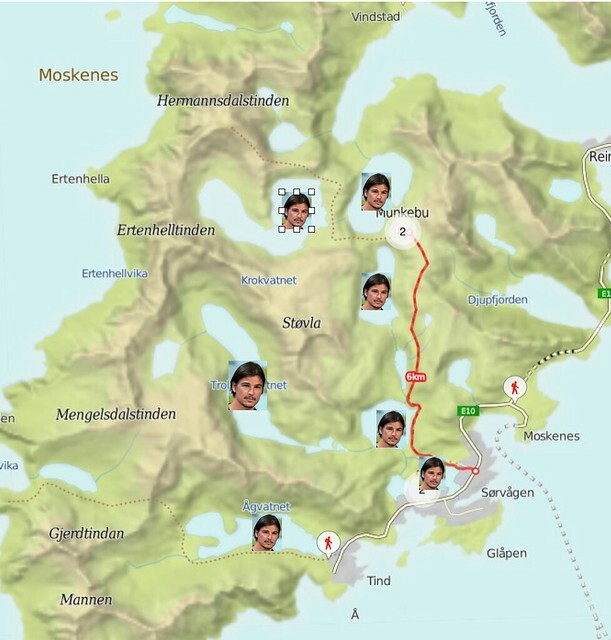 As Moskenesøya became more clearly defined, we tried to figure out where our hike would take us. That’s right! 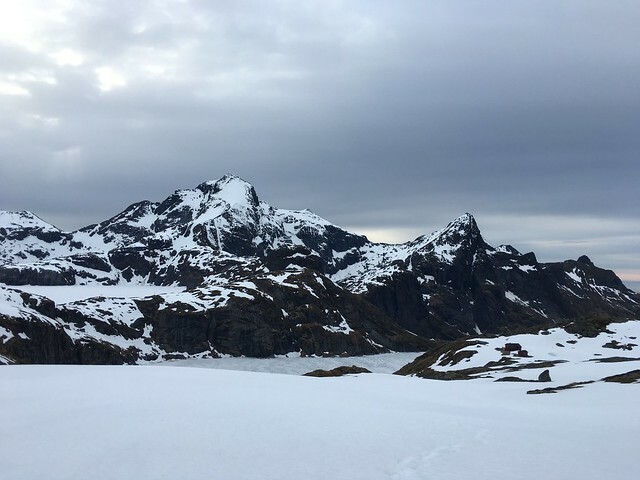 Within 24 hours of having flown across the atlantic, crossing Norway and taking a boat out to a place most people haven’t heard of, we were going to backpack 5 kilometres into the wilderness and leave our hopes to the snow gods. 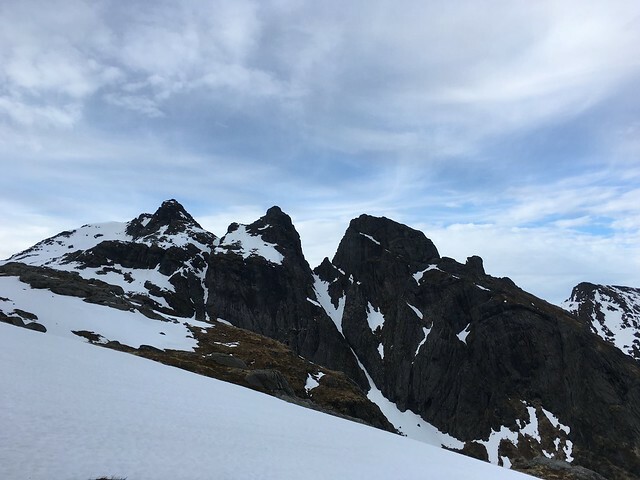 They were not ready yet, as all the higher summits still had plenty of snow. The original plan had been to summit Hermannsdalstinden, but we weren’t foolhardy enough to try a 40 degree slope in tennis shoes and no other gear. 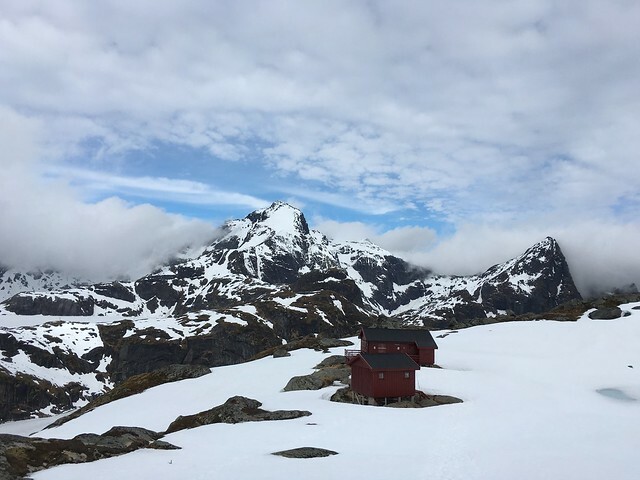 We would have to be content with hiking in to the Munkebu hut and spending the night there. Sørvågen and Moskenes harbour just starting to come into view. The ferry touched down at Moskenes at 4:30pm and we started walking west. It is 2km of walking along the E10 to the town of Sørvågen. The road is narrow and the shoulder fits only one person, but everyone drives slowly and walking along the road is acceptable and expected. The seaside is spectacular, and the mainland was still visible. The weather was reasonable, temperatures must have been in the 5-10C range, with only a slight breeze. 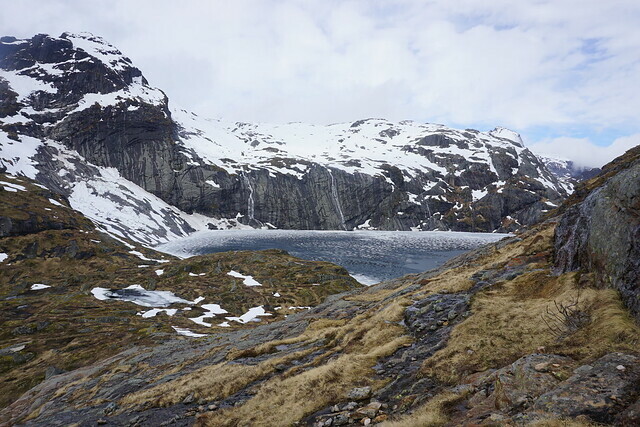 The hike to Munkebu hut begins from the lake called Sørvågvatnet in the town centre. A trail goes around the lake, and the eastern entrance is from the lane to the post office. Turn right here and the proceed down the street to reach the beginning of the trail. We made a couple of wrong choices and had to cross a few people’s backyards to get back on track, but generally head towards the lake and you can’t miss it. 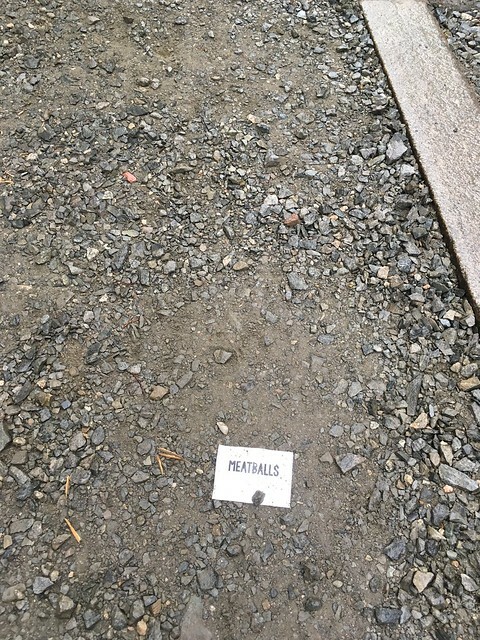 Before we start hiking, one thing has to be made clear so Norwegian words don’t keep tripping you up. More seriously, vatnet is lake, and tind is pinnacle, but in Norwegian, pinnacle is used the way we use peak. Beginning the hike to Munkebu. : Stuvdalsvatnet with Støvla in the background. This is about a kilometre in to the hike to Munkebu Hut. We encountered several people near the lake, including two cute, tiny girls and their dog, who told us which way to go when the trail got boggy. 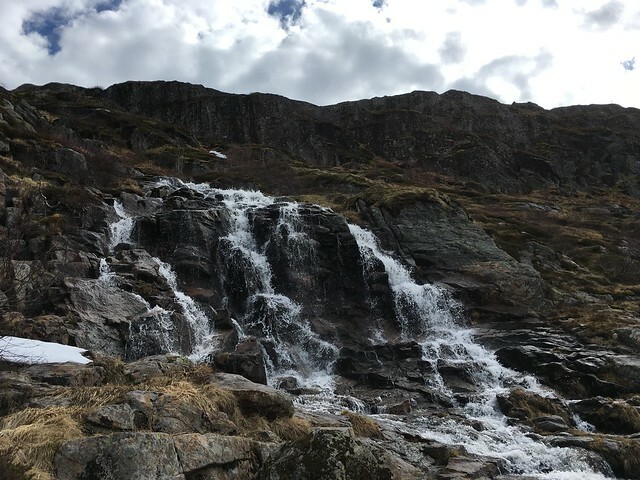 At least in the Lofoten, the water from all freshwater sources is safe to drink and I filled up along the trail. The residents of Sørvågen actually use the water from the lakes we would be hiking along and there are signs forbidding swimming in these lakes. The hike skirts several lakes, gaining most of the elevation at the beginning and the end. It is 5km and about 600m (~2000ft) uphill. The lakes and mountains are breath-taking, from oblong Tindalsvatnet to glittering Fjerddalsvatnet. Fjerddalsvatnet from the southern tip: Fjerddalsvatnet with Moldtinden dumping water into it. Taken before the never-ending hike up Djupfjordheia. The trail tends to stick close to some lake, then suddenly go uphill, leaving you hundreds of feet above another lake. Several sections of trail were boggy, and no attempt had been made to engineer a nicer trail, leading to lot’s of footpaths. I guess they don’t have enough traffic yet to worry about erosion. We ran into a small group at Fjerddalsvatnet, and a solo hiker halfway up Djupfjordheia. He had tried to ascend Munken, but given up due to sketchy snow almost at the top. The section along Lake Tindal and Fjerddal is incredibly scenic and also flat. The final obstacle is cresting the hill called Djupfjordheia. Several factors made this painful. 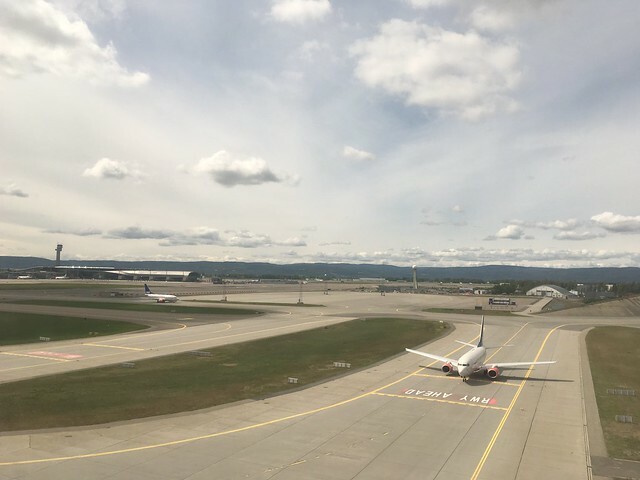 One; jet lag and travel fatigue was starting to catch up, two; we were encountering patches of snow, leading to cold feet, three; the clouds had started moving in for a while, lessening the wow factor and finally, something I call the Metric Map Paradox. In the USA, maps use miles and feet for distance and elevation. The sane world uses kilometres and metres. Unfortunately, a mile is greater than a kilometre, but a foot is less than a metre. This means that European maps are stretched horizontally, but compressed vertically. My lizard brain was interpreting this as making quick progress on the horizontal. On the other hand, Djupfjordheia, which looks so short on the map, presented three false summits and never ended by feet standards! We were relieved more than anything to be on top and able to see Munkebu hut. Our spirits did rise a little at the incredible views that opened up! Merraflestinden and Djupfjorden with the E10 crossing: The mainland is just visible in the background as clouds move in. 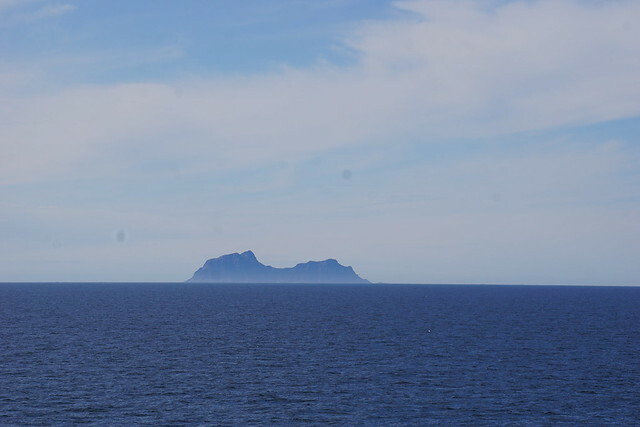 Munken: The 3 peaks of Munken. From here, it was another kilometre of slogging through snow to Munkebu hut. Since the hut was closed and no one else was around, we pitched the tent right on the hut patio, to give us some insulation and convenient flatness. Water was available from tiny melted out sections of the lakes next to the hut. It was fun to just dip my bare hands in icy water to fill the bottle and transfer it to the MSR Dromedary. Most of the time, having a high metabolism is a blessing. Dinner was garbanzo beans, bread, and… garlic sauce! 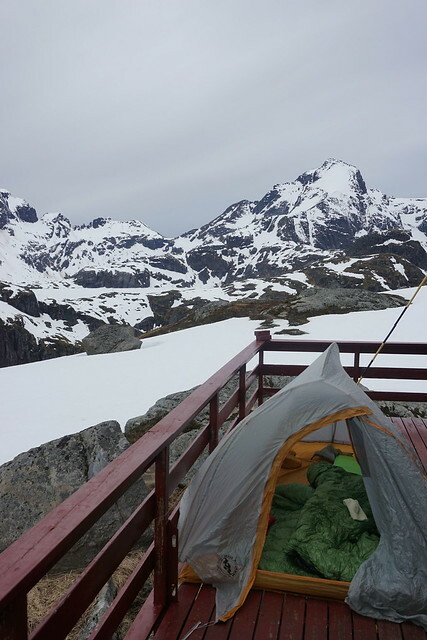 Our tent at the Munkebu Hut platform. We had the place to ourselves. We reached the hut around 8pm. Between reading 1632, eating cookies, dealing with a noisy tent, and incessant light, sleep did not come around till midnight. The sleep deprived arctic adventure was off to a great start! Mountain views: Hermannsdalstinden and Brynliskartinden with Tennesvatnet in the foreground. Taken from Munkebu hut. Read more by category or series.